Want to make your patio more relaxing? A patio is the perfect space to rest, unwind and relax. When you get home from a long day at work, you can kick back on your patio while enjoying the fresh air. However, to get the most use of your patio, you should design it with relaxing furnishings and elements. Here are some tips to create a more relaxing patio. We’ve discussed a variety of comfortable patio seating options here on our blog, but one we haven’t discussed is a hammock. Consisting of a sling-like design made of fabric or netting that’s suspended between two anchor points, it offers the perfect lounging area for a patio. They are comfortable, easy to set up and look great in all styles of patio decor. Be warned, though, you may find yourself falling asleep when lounging on a hammock. Since they create a weightlessness feeling, it’s easy to doze off when lounging on a hammock. A fire pit offers more than warmth; it also promotes a more relaxing environment. According to research cited by Scotsman, the mesmerizing appearance of a fire combined with its unique crackling sound reduces blood pressure while subsequently lowering stress levels. A similar study conducted by researchers from the University of Alabama found similar results. After asking more than 220 adults to watch a video of a fireplace, they discovered that participants who watched the fireplace experienced lower blood pressure levels than their counterparts who didn’t watch it. So, please go get a fire pit – for your health! Assuming your patio is open, you should consider screening it in. Screened-in patios are more relaxing than open patios for several reasons. First, they provide a higher level of privacy, which naturally creating a more relaxing environment. Secondly, a screen enclosure keeps pesky bugs like mosquitoes, wasps, flies and gnats out of your patio. It’s difficult to lounge on your patio when you’re being bombarded by flying insects. If it’s screened in, however, you won’t have to worry about this. You and your family can enjoy this outdoor extension of your home without the threat of pesky bugs. Don’t underestimate the importance of using the right colors in your patio decor. According to research cited by Fox News, some of the best colors for reducing stress include lavender, pale gray, blue, aqua, pale pink and beige. Of course, these are just a colors to consider when decorating your patio. On the other hand, black has the opposite effect by raising stress. Focus your patio decor around stress-reducing colors to enhance the environment and make it more relaxing. Rather than using traditional overhead lighting on your patio, consider using mood lighting. Mood lighting is a more subtle form of illumination that, as the name suggests, enhances the mood of the surrounding space. You can install track lighting or wall sconces on your patio, for example, to improve the decor and mood. For an added touch, install a dimmer on your mood lighting. When you want to relax in the evening, you can turn down the brightness of your patio lighting. Even if you’re not a “green thumb,” you can still take advantage of the relaxing, stress-reducing properties of plants. Adding a few colorful container plants to your patio, for instance, creates a more relaxing environment. Furthermore, plants improve the air quality around your home by filtering impurities and releasing fresh oxygen. You can’t expect to create a relaxing patio if it’s dirty or cluttered. And with spring right around the corner, there’s no better time than the present to clean up your patio. This means sweeping off leaves, scrubbing the deck or flooring, and cleaning the furniture. Finally, arrange your patio furniture and furnishings to create a symmetrical design. When your patio features proper symmetry, it creates a more relaxing environment. Unfortunately, this is something that many homeowners overlook when designing their patio. They assume it’s okay to arrange their furniture and furnishings in unsymmetrical designs. In doing so, they create a poorly balanced decor that’s not particularly relaxing. These are just a few tips to create a more relaxing patio. With a relaxing patio, you and your family will be able to fully enjoy this extension of your home. How Much Should I Spend on a Fire Pit? The cost of a fire pit can range from just $100 bucks to over a $1,000. Because most consumers are unfamiliar with its pricing, it can lead to confusion when trying to choose one. You don’t necessarily want to purchase the cheapest fire pit, but you probably don’t want to break into your savings account either. So, how much should you spend on a new fire pit? Remember the age-old adage “you get what you pay for?” Well, it holds true when speaking of fire pits. Far too many companies are only in the business of making and selling fire pits to earn a quick buck. They use low-quality materials that don’t perform as well as their higher quality counterparts. If you’re going to buy a fire pit, spend the extra money on a premium brand. Another problem associated with cheap fire pits is the potential for dangerous chemicals and toxins. Just because a fire pit looks safe and clean doesn’t necessarily mean that is it. Companies will often outsource the production of their fire pits overseas, using harmful chemicals and toxins that are otherwise banned here in the United States. To make matters worse, the average consumer never knows that he or she is being exposed to these chemicals. Choosing to purchase a premium fire pit that’s made in the U.S. eliminates this problem while giving you peace of mind knowing that you are contributing to the country’s economic job growth. It should come as little-to-no surprise that premium fire pits are more effective at radiating heat than cheap fire pits. A high-quality stainless steel fire pit, such as those sold here at S&S Fire Pits, will create a superior level of warmth and comfort. At first glance, it may seem like a financially smart decision to purchase a cheap $100-$200 fire pit as opposed to a $500 fire pit of higher quality. Doing so may save you a couple hundred bucks initially, but you have to consider its longevity. Cheap fire pits are made with cheap, low-quality materials, increasing the risk of it degrading and breaking down in a short period of time. It may work just fine for six months or even a year, at which point it rust begins to eat through it, rendering it useless. If you’re planning to use a fire pit, either on your patio or other outdoor living area, you’ll need to stockpile plenty of firewood. The right firewood will keep your fire pit going long into the night, allowing you to get the most use and enjoyment out of this accessory. Whether you purchase a full cord, face cord or half cord, though, you should avoid making the following mistakes when storing firewood for your fire pit. The exterior of your home may seem like an ideal place to store firewood, but this isn’t recommended. Firewood can attract all kinds of pests, including termites, spiders, roaches, centipedes and scorpions. And if you store it directly against your home’s exterior, some of these pests may find their way inside your home. To prevent this from happening, store firewood at least 20 feet away from your home. Why shouldn’t you store firewood on the ground? If it’s placed directly on the ground, it will absorb moisture from the soil. Over time, firewood can absorb so much moisture that it’s unable to light or stay lit. A simple solution is to store your firewood just a few inches off the ground using a wooden pallet. It doesn’t have to be particularly tall; just 2 or 3 inches off the ground should keep your firewood protected from ground moisture. Never leave your firewood outside without some form of shelter or cover. It’s perfectly fine to store firewood outside, but it needs a shelter or cover to protect it from the elements. When left exposed to the elements, firewood will absorb moisture from rain, sleet and snow. This is concerning because wet firewood has a lower combustion efficiency than dry firewood, meaning it produces more smoke and less heat. If you’re going to store firewood outside, consider placing it in a utility shed. Just remember to keep it off the ground as well. When stored in this manner, firewood will stay dry for months or even years. It’s also important to store the right type of firewood. You can’t burn just any type of wood that you find lying around your home or yard. Pressure-treated wood, for example, is typically used and construction and contains liquid preservatives to deter microorganisms, pests and decay. When burned, pressure-treated wood will release toxic fumes because of its preservatives. So, what type of firewood can you store? The best type of firewood is dry, untreated wood logs from hardwood trees. Hardwood trees are denser than softwood trees. And with more organic matter, they burn longer than softwoods. Arrange your firewood in alternating rows of logs so that air is able to easily pass through it. Some homeowners simply stack their firewood so that the logs are flush with one another, neglecting to create space through which air can flow. Without adequate airflow, however, your firewood won’t be able to dry out. Rather, moisture will get trapped inside the wood, causing it to rot or develop mold. If you discover that your firewood has rotted or developed mold, you’ll need to throw it out and start back over. You might be eager to build fires in your fire pit after acquiring some firewood, but you need to make sure that it’s dry first. If it’s fresh wood that was recently harvested, you must wait for it to dry — a process that can take up to a year for certain types of wood. Retrieving firewood from your storage area prematurely will result in a low-quality fire that produces minimal heat and a lot of smoke. Therefore, you should remain patient while waiting for your firewood to dry. Also known as seasoned firewood, dry firewood has a lighter color than fresh firewood of the same type. Most hardwoods have a brown/tan color when fresh. After drying for up to a year, however, they turn to a light brown color, indicating that it’s ready to burn in your fire pit. How big is your patio? Even if it has limited space, there certain things you can do to make it look bigger. In turn, this will create a more attractive, enjoyable outdoor living space for you and your family. Whether it’s used in the living room or on the patio, a focal point will create the perception of a larger and more open space. It works by drawing by drawing your attention away from the surrounding design elements so that the patio appears bigger. So, what can can you use as a focal point on your patio? A fire pit is always an excellent choice, as it’s typically the center of attention during backyard parties and barbecues. Just remember to keep it at least 10 feet away from your home or any other combustible structure. Another idea is to use a water fountain as your patio’s focal point. Unfortunately, though, most water fountains are bulky and large, making them a poor choice for a small patio. Decorating your patio with small plants creates the optical illusion of a small space. Rather than using large containers to hold your patio’s potted plants, use small containers. Granted, not all plants will grow in a small container; many have complex root structures that require large containers. If you’re worried about lack of space hurting your patio’s aesthetics, though, decorating your outdoor living space with small plants in small containers will have a positive impact on its appearance. It’s also worth noting that small plants are easier to grow and maintain than large plants. They require less water and sunlight, and you can easily move them indoors when the fall season arrives. Neglecting to mow and maintain your lawn will hurt your patio’s aesthetics by making it appear smaller and less spacious. To prevent this from happening, you should mow your lawn at least once a week during the spring and summer months. And if you discover any fast-growing weeds emerging through the soil, remove them ASAP. Maintaining your lawn at 2 to 3 inches will improve your home’s curb appeal while making your patio look bigger and more spacious in the process. Not only to they pose a safety hazard — they could fall and injure you or anyone else on your patio — overhanging tree branches have a claustrophobic effect that makes the surrounding area appear smaller. Unless they are essential for shade, you should consider removing them. There are special chainsaw-like tools designed specifically for removing tree branches. You extend the tool to the branch, grasp the branch between its teeth, and it does the rest. If this sounds too difficult, you can also contact a professional tree removal company in your area. When choosing furniture and accessories for your patio, consider the color and how it corresponds with the color of your home. If your patio furniture contrasts to the color of your home’s siding, it will create the appearance of a smaller space. On the other hand, using furniture in the same or similar color as your home’s siding will make it look bigger. Don’t make the mistake of using too many pieces of furniture on your small patio. If you’re tight on space, adding a half-dozen chairs will only hurt its aesthetics. A smarter solution is to include just a few chairs and a single table on your patio. You can still keep extra chairs in a storage shed or your garage. That way, when you have friends and family over, you can offer them somewhere to sit. Using fewer pieces of furniture also reduces the need for maintenance. Whether it’s Adirondack chair, chaise lounge chair or a bench, you’ll need to clean your patio furniture to protect it from mold and mildew. The more pieces of furniture you use on your patio, the more time and effort you’ll have to invest into maintaining it. Stick with just a few pieces of furniture to make your patio look bigger and minimize maintenance. A common interior design trick used in small rooms is to hang mirrors on the wall. This creates the perception of a larger room room while enhancing its decor in the process — and you can use the same approach to make your patio look bigger. Assuming your patio is right against your home, try hanging on one or two medium-sized mirrors against your home’s siding. The only downside to this design trick is that you’ll need to clean your mirror or mirrors on a regular basis. When used outdoors, they’ll accumulate dirt, dust and moisture. It’s frustrating when you light a fire pit, only for the flame to die out. In some cases, it may burn for 10 or 20 minutes. In others, it may immediately die out after lighting it. While you can always relight your fire pit, this is only a temporary solution that doesn’t solve the underlying problem. 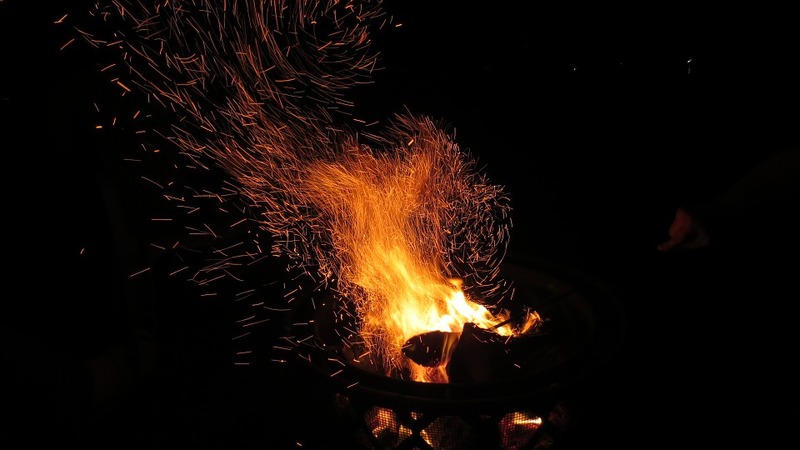 So, if you’re tired of constantly lighting and relighting your fire pit, consider the following tips to keep it burning all night long. Even if it looks dry, your firewood probably has moisture in it. Whether oak, maple, cherry, elm, chestnut or hickory, all types of wood absorb moisture. Normally, this isn’t a problem. But if firewood contains too much moisture, you may struggle to keep it lit. This is why it’s recommended that you only use dry firewood — classified as a moisture content of 20% or less — in your fire pit. You can also keep your fire pit burning all night long by using larger pieces of firewood. Granted, larger pieces of firewood are more difficult to light than smaller pieces. Once you get them lit, however, they’ll burn longer while creating more heat in the process. Try placing some smaller pieces of firewood underneath larger pieces. After lighting the smaller pieces, the flame should ignite the larger pieces, providing you and your guests with a long-burning fire. The placement of your fire pit will affect its ability to retain a flame. If it’s placed out in the open, wind gusts may extinguish it. You can prevent this from happening by placing your fire pit next to a windbreak, such as a retaining wall. With that said, the golden rule of using a fire pit is to place it at least 10 feet away from any flammable or combustible surface, including your home. If it’s too close to these surfaces, a stray ember from your fire pit may cause an unintentional fire, which is something that you probably want to avoid. Before placing firewood inside it, wipe dry the inside of your fire pit with a paper towel or cloth. Moisture has a tendency to accumulate inside of fire pits, especially if they are left outdoors. And if you don’t dry it out, any firewood that you place inside will immediately become saturated with moisture, thereby making it difficult to light and stay lit. It only takes a couple minutes to wipe out the inside of your fire pit, but doing so encourages a sustainable fire. Fire pits need oxygen to stay lit. If you stack your firewood so that it can’t breathe, the fire will likely die out shortly after being lit. There are several different ways to place firewood inside of a fire pit so that it can breathe, one of which is to use the teepee method. As the name suggests, this involves arranging the wood in the V-shape of a teepee. The bottom center of the fire pit remains open, thereby allowing air to enter and pass through. As this area heats up, it ignites the rest of the firewood. Alternatively, you can arrange your firewood in log cabin stacks. This involves placing a row of firewood in one direction, and then topping it with another row of firewood running perpendicular to the first. Pay attention to the weather, as Mother Nature can hinder your ability to create a long-lasting fire. If there’s rain in the forecast, you may want to postpone your fire-burning activity. Even high humidity can make it difficult to create and maintain a fire. Ideally, you should wait until the weather is dry with clear skies to light your fire pit. Otherwise, you may struggle to keep it lit throughout the night. Even if you follow all the tips previously mentioned, you may still discover your fire pit going out. This is bound to happen if you there’s no enough firewood inside of it. To keep your fire pit burning all night long, you must continue to resupply it with additional firewood. When the fire begins to die down, toss a couple extra pieces on top. Assuming there’s still some hot embers or coals left, the new firewood should easily ignite to keep your fire going. Just remember to arrange the new firewood so that it doesn’t smother the existing embers or coals. Whether you’re using your fire pit to grill burgers, roast marshmallows or simply provide a relaxing ambiance for you and your guests, you should follow these tips to keep it burning throughout the night. When designing an outdoor living space, it’s essential that you create a focal point. As the name suggests, this is the space’s point of focus. It’s the object or element that naturally attracts your attention, making it the single most important component of your home’s outdoor living space. And while there are several solutions available for creating a focal point, a fire pit often works best for the following reasons. One reason to use a fire pit for your outdoor living space’s focal point is because it’s unique. This doesn’t necessarily mean that no two fire pits are the same. Rather, it means that a fire pit is a unique decorative element when used in your outdoor living space. Unless you have two fire pits, it will create a unique appearance that’s not found in other decorative outdoor accessories. But the unique appearance of a fire pit is just one of many reasons to use it a focal point for your outdoor living space. When a fire pit is lit, people will naturally gather around it. It’s only human nature to gather around as fires, as we’ve been it since the dawn of mankind. Whether you’re lounging outside with your family or hosting an outdoor party with the entire neighborhood, you’ll probably discover people gathering around your fire pit when it’s lit. As a result, their attention will be focused on the fire pit, thereby enhancing its utility as an outdoor focal point. Designing your outdoor living space with a fire pit as the focal point will also repel pests. If you place it in the center of your patio, for example, the smoke it produces will deter mosquitoes, wasps, gnats and other common outdoor pests. Most insects hate smoke, so a fire pit acts as a natural pest repellent. To take full advantage of this, though, you’ll need to place it in the center of your outdoor living space. Otherwise, the smoke won’t adequately cover the surrounding space. Want to improve your home’s curb appeal? Try using a fire pit as the focal point. High-quality fire pits, such as those sold here at S&S Fire Pit, are designed with premium steel materials that compliment most outdoor living spaces. They introduce a new metallic finish and visual style that, ultimately, will improve your home’s curb appeal. If it’s not used as the focal point, however, it won’t have the same, positive impact on your home’s curb appeal. Using a fire pit as the focal point will help you create a warmer and more comfortable outdoor living space. Even if you live in the South, you’ll probably get at least some days of the year when the temperatures are brutally cold. A fire pit in the center of your outdoor living space, however, will create warmth that allows you to enjoy this extension of your home throughout the year. From spring to winter, you can rest assured knowing that a fire pit will provide ample warmth for your outdoor living space. Regardless of where it’s placed, you can use an outdoor fire pit to cook meats, vegetables and other foods. But when used as the focal point, it makes cooking a little easier. When your fire pit is the designated focal point, you — as well as your family members and/or guests — will gather around it. This means you won’t have to walk long distances from your seat to the fire pit. Now that you know the benefits it offers, you might be wondering how to use a fire pit as the focal point for your outdoor living space. The key thing to remember with focal points is that they should be the center of attention. Assuming your outdoor living space has seats (which it should), it’s usually best to place the focal point in the middle of them. In other words, arrange your outdoor living space’s chairs, benches, stools or other seats around your fire pit. Also, remember to draw attention to your fire pit using lighting. Installing a new light fixture can illuminate your outdoor living space while drawing attention to your fire pit in the process. A fire pit is just one option to consider when choosing a focal point for your outdoor living space. As revealed here, however, it offers several unique benefits. Among other things, using a fire pit as the focal point creates a unique appearance, serves as a natural gathering, repels pests and makes cooking easier. Just remember to choose a high-quality fire pit rather than a cheap, generic brand. A little shade can make a world of difference in your comfort level when lounging outdoors on an otherwise hot spring or summer day. With the shade protecting you from the sun, you’ll feel cooler and more comfortable, allowing you to enjoy your patio. Shaded areas technically aren’t cooler than adjacent sun-exposed areas. However, it feels up to 15 degrees Fahrenheit cooler because of the lack of solar radiation. So how can you create a cool and comfortable shaded area on your patio? A shade sail is a simple and inexpensive solution to create a shaded area on a patio or outdoor living space. With origins dating back to Ancient Rome, it’s also a time-tested method that’s been passed down for centuries. A shade sail consists of a lightweight membrane fabric that’s stretched and anchored between three or or more points. You stretch the shade sail across your patio, securing the corners to anchor posts. Because of their simple design, shade sails have become a popular choice among homeowners. Manual: As the name suggests, manual awnings are operated by hand. You must turn a lever or similar control mechanism to take down or bring up the awning. Manual awnings typically contain less parts than their motorized counterpart, and they are also less expensive. Motorized: These awnings have a motorized function in which the homeowner presses a button to take down or bring up the awning. Because of their additional motorized parts, there’s a greater risk of failure. However, many homeowners prefer the ease of use offered by motorized awnings. If you’re willing to wait a while, you can always create a natural shaded area on your patio by planting some trees on the sun-facing side. When choosing trees, look for species that grow tall and fast. Some excellent choices include red oak (Quercus rubra), green ash (Fraxinus pennsylvanica) and London planetree (Platanus × hispanica). Just remember to plant them on the side of your patio that faces the mid-day sun. Otherwise, it’s not going to offer much protection from the sun’s rays. As a side benefit, studies have shown that adding trees to a landscape increases the home’s selling value. The Arbor Day Foundation (ADF), for instance, says that mature trees have an appraised value of $1,000 to $10,000. So, even if they cost money and time to plant, it will pay off in the form of a higher home value. Another simple shade solution for your umbrellas is an umbrella. No, I’m not talking about a traditional umbrella that hold while walking to protect yourself from the rain. There are special types of large, heavy-duty umbrellas designed specifically for use on patios and other outdoor living spaces. They offer a larger coverage area than traditional umbrellas, and they are usually made of durable materials to withstand the harsh outdoor environment for long periods of time. Some of these patio umbrellas mount directly to the top of a table, while others are freestanding. If you already have a table on your patio, consider the former. If you don’t have a table, the latter is probably the best choice for your patio. A lesser-known shade solution for the patio is a pergola. Typically found in gardens, it consists of multiple horizontal beams that are often covered with plants, flowers or fabric. Some people assume that pergolas are the same as arbors. While they share some similarities, though, they are two unique designs with their own specific characteristics. An arbor, for example, is usually characterized by a wooden bench or seats with an overhanging roof that’s enclosed by lattice panels, whereas a pergola is a larger and more open structure that doesn’t necessarily have seating underneath. Finally, you can always a build a roof over your patio for shade and protection from the sun. This is probably the best solution in terms of sun protection. However, it’s also the most expensive. According to The Nest, a wood-framed root can cost anywhere from $1,000 to $10,000. If you’re on a tight budget, consider a lattice-top roof, which usually runs around $1,000. You can then cover the lattice with a fabric or other material to block sunlight. These are just a few ways to create shade on your patio. Regardless of which one you use, make sure the design flows cohesively with the resto f your patio decor. Outdoor living isn’t just another fly-by-night trend that’s here today and gone tomorrow. It’s here to stay — and for good reason. Patios, porches, decks, gardens and other outdoor living spaces allow homeowners and families to enjoy the outdoors. But if you want to take advantage of your home’s outdoor living space, you should include the following “must-have” items. When the sun goes down, you’ll need lighting to illuminate your outdoor living space. Granted, you may already have an overhead fixture available, assuming it’s a patio or back deck. However, you can still incorporate other, more stylish lighting options into your outdoor living space. This includes string lights, globe lights and free-standing lamps. Just remember to stick with an energy-efficient bulb type, such as compact fluorescent lighting (CFL). While CFL bulbs cost more than incandescent, they last longer and consume less energy, making them a smart financial investment in the long run. Depending on where you live, you may have trouble enjoying your outdoor living space due to the presence of insects. Mosquitoes, for instance, are a common occurrence throughout the Southeast. Although small in size, these blood-sucking insects can create serious chaos for homeowners and their families. There are a few ways to keep them away from your outdoor living space, however. One option is to enclosure the space with a mesh screen. Alternatively, you can install citronella tiki torches around your outdoor living space. Either way, you need some form of insect protection to enjoy this space. A third must-have item for an outdoor living space is a fire pit. This versatile, multi-purpose item will open the doors to a whole new world of activities for you and your family. With a fire pit, you can grill foods, roast marshmallows, create warmth and provide a more relaxing ambiance. And unlike a fireplace, you can always move your fire pit to a new location. Perhaps this is why fire pits consistently rank as one of the top accessories for outdoor living spaces. It’s also a good idea to incorporate some type of share over your outdoor living space. Whether it’s a table-top umbrella, awning or a newly constructed roof, shade is an invaluable component for a relaxing and enjoyable outdoor living space. Without shade, the blistering-hot summer sun can make it difficult to fully enjoy this space. You can’t expect to fully enjoy your home’s outdoor living space without comfortable seating. Don’t just toss some old plastic chairs here and call it a day. Instead, consider using more comfortable, stylish chairs that flow cohesively with the space’s decor. High-quality wood chairs are always an excellent choice, although they typically require staining to protect against mildew and mold. One exception is teak wood, which contains natural oils that repel mildew, mold and decay. Alternatively, another idea is to use wicker chairs. We talk about wicker chairs in a previous blog post, but basically they consist of woven organic material that’s lightweight and inexpensive. The only downside to using wicker furniture is its susceptibility to damage. Why do you need a storage chest for your outdoor living space? Well, to store small items when you aren’t using them. Assuming you use your fire pit to cook foods, for instance, you’ll probably need a wire grill brush and tongs. If you have a storage chest, you can stash these and other similar-sized items inside. A popular storage solution for patios and other outdoor living spaces is a storage ottoman. Like indoor storage ottomans, it doubles as a footrest and storage chest. You can place it in front of your chairs or seating to use a footrest. And when you’re ready to go inside, you can lift the top to stash small items inside. You should also include an outdoor rug in your outdoor living space. A rug will define your outdoor living space while adding new color and style to the decor in the process. Keep in mind that any rugs used in your outdoor living space should be made of a synthetic material that’s not going to mildew or otherwise become damaged from the outdoor elements. Traditional all-wool rugs are a poor choice. Instead, synthetic materials like polypropylene are recommended. You’ll still need to wash your outdoor rug on a regular basis, but it shouldn’t sustain damage from being outdoors. Finally, your outdoor living space needs a table. It doesn’t have to be a full-sized table. On the contrary, smaller tables often look and function better in small spaces. You can use your table to place drinks, plates and other items. However, you should choose a table that matches the chairs and surrounding decor. Trees are an invaluable element of a home’s landscape. Unfortunately, some homeowners view them as nothing more than added maintenance, so they avoid growing them. However, trees can benefit your home and landscape in several ways, some of which we’re going to discuss in this blog post. Thanks to the natural shade they produce, adding trees to your landscape will create a cooler outdoor space. The actual temperature underneath a tree isn’t lower than a non-shaded area. However, it feels cooler here because there’s less solar radiation. The temperature of a shaded area and non-shaded area are the same, but the former feels cooler due to the lack of solar radiation. So, growing trees on your landscape will create a cooler outdoor space for you and your family to enjoy. Of course, trees also encourage outdoor living. It’s difficult to fully enjoy your home’s outdoor living space in the summer with the blistering-hot sun. As the mercury rises, you and your family may be forced to seek shelter from the heat. This isn’t an issue if your landscape has trees, however. The natural shade will keep you and your family cool while also protecting against sunburn. As a result, you’ll be able to fully enjoy your home’s outdoor living space. Can growing trees in your landscape really increase your home’s value? Quite possibly. The Council of Tree and Landscape Appraisers (CTLA) says that a single mature tree adds roughly $1,000 to $10,000 to the respective home’s property value. Other studies have shown that homes with an attractive landscape are worth 10% to 15% more than their counterparts with poorly designed landscapes. The bottom line is that homebuyers want landscapes with trees, so growing them in your landscape can potentially raise your property’s selling value. You might be surprised to learn that trees can lower psychological stress. Statistics show that 77% of U.S. adults experience physical symptoms caused by psychological stress, some of which include high blood pressure, sweating, headaches and trouble sleeping. When symptoms such as these manifest, it can affect other aspects of your life. Growing trees in your landscape, however, can help by lowering your stress levels and potentially eliminating some of the symptoms associated with stress. Researchers from the University of Hong Kong and University of Illinois conducted a study in which participants were asked to rate their level of stress after viewing images of forests in varying densities. Researchers found that the participants were the least stressed after viewing the most dense forests. Basically, viewing images of trees and forests reduced participants’ stress levels by making them feel calmer and more relaxed. There are countless ways to reduce energy usage in a typical home, including the use of compact fluorescent lighting (CFL), installing blackout curtains, low-flow showerheads, and adding extra insulation to the basement and attic. However, growing trees in your landscape can also reduce your home’s energy usage. The National Arbor Day Foundation (NADF) explains by saying that trees planted on the east, west and northwest sides of a home will lower its cooling needs during the summer by up to 35%. Trees essentially prevent solar radiation from reaching the windows and siding; thus, keeping the home cooler and subsequently taking some of the burden off the central air conditioning system. And don’t assume that it will take a tree forever to grow. According to the U.S. Department of Energy (DOE), a 6- to 8-foot deciduous tree will begin shading the home in its first year. Furthermore, trees typically begin shading the home’s roof within 5 to 10 years. So, go ahead and plant a tree today if you want to reap its energy-saving benefits. Trees require very little work or time to maintain. Unlike grass or flowers, you typically don’t have to water or fertilize trees. The only exception is during a young tree’s first few seasons, in which case you should water it. Once the tree has matured, however, the only maintenance you’ll need to do is inspecting it for disease and damage, as well as occasionally pruning away unnecessary branches. Other than this, trees don’t require much effort to maintain. Finally, growing trees in your landscape will create cleaner air. Just because the air looks clean outside your home, doesn’t necessarily mean that it is. Air pollution is a serious threat that’s particularly problematic in busy cities. Growing trees, however, is one of the easiest way to promote cleaner air. Trees absorb airborne pollutants, such as nitrogen, ammonia and sulfur dioxide, and they also release fresh oxygen back into the atmosphere. This, of course, is one of the reasons why many cities and municipalities grow them. 70% Seventy percent of all homes in the United States have an outdoor living space, and roughly 70% of these households use their outdoor living space at least once per week, according to a study conducted by the American Home Furnishings Alliance (AHFA). An outdoor living space allows homeowners and family members to enjoy the beautiful outdoors. Rather than staying cooped up indoors, they can go outside to cook, host parties or simply relax. However, one of the most common reasons cited by homeowners for not creating an outdoor living space is the cost. Some homeowners assume that outdoor living spaces are too expensive to create. Like most renovations, it usually requires an upfront monetary investment, but there are ways to reduce these costs. So, if you want to create an outdoor living space without breaking into your savings account, check out the following tips. You don’t have to spend a fortune on an expensive privacy fence for your outdoor living space. An easy do-it-yourself alternative that costs a fraction of the price is a lattice fence. You can typically buy large panels of lattice for about $10 to $50 bucks a piece. Using just a few of these panels, you can create an attractive privacy fence that’s perfect for your outdoor living space. When choosing lattice for your outdoor living space, make sure it’s pressure treated to protect against rot, decay and termites. Additionally, consider the color and how it conforms to the surrounding decor. The color of the lattice should flow cohesively with the space’s decor. No outdoor living space is complete without a source of fire. When the sun goes down and the temperatures drop, a fire will allow you and your family to continue enjoying this space. If you’re on a budget, though, you should choose a portable fire pit instead of a fireplace. As explained by ImproveNet, the average cost of a professionally installed outdoor fireplace in the United States is between $1,400 and $20,000. A more budget-friendly solution is a portable fire pit. High-quality fire pits are available for just a few hundred bucks. As an added bonus, you can easily move them to different areas — something that can’t be said for an outdoor fireplace. You can enhance the decor of your outdoor living space by adding some potted plants to it. Before buying new plants at your local gardening center, however, try cloning some existing plants in your landscape. Cloning involving cutting a steam off a parent plant and placing it in damp compost, either with or without growth hormones. When done correctly, the stem will grow into a new plant. It may sound difficult, but it’s actually pretty easy. And best of all, it allows you to grow new plants for your outdoor living space without paying a dime (except for the pots and containers). If your outdoor living space isn’t shaded or covered, consider investing in a large patio umbrella. This otherwise simple accessory will protect you and your family from the sun’s blinding rays as well as rain, snow and falling leaves. You can find patio umbrellas available in free-standing models or table-attached models. Free-standing patio umbrellas are designed to stand upright on their own, without the need for additional support. A table-attached umbrella, on the other hand, is designed to sit atop a table, covering the surrounding space. Both styles are perfectly fine, though the former usually costs more than the latter. Perhaps the most important element of an outdoor living space is seating. Without seating, neither you nor anyone else will be able to enjoy this extension of your home. You can check out some of our previous blog posts for more ideas on outdoor seating, though some of the top choices include wicker chairs, teak lounges, benches, hammocks, Adirondack chairs and swings. According to the decorating experts at HGTV, you can enhance the decor of small outdoor living spaces by using tall decorative accessories. Tall vases or bamboo plants in a container, for instance, create the perception of a larger and more open area. Furthermore, tall decorative accessories such as these add color and vibrancy to the surrounding space. If your existing outdoor furniture is approaching the end of its lifespan, you might be able to squeeze a little more use of out it by painting or finishing it. Buying an new set of outdoor furniture can be expensive. However, painting and finishing is a cheap alternative to revitalize your old, aged furniture. Just remember to choose a color that matches out outdoor living space’s existing decor. Curb appeal refers to the collective landscape, colors, furnishings and other visual elements of a home’s exterior. By investing in a little time and energy into your home’s curb appeal, you’ll create a more pleasing outdoor environment for you and your family to enjoy. Furthermore, studies show that home’s with an attractive curb appeal have a higher selling value than their counterparts with little-to-no curb appeal. So, whether you plan on staying in your home or selling it, you should follow the tips listed below to enhance its exterior. A fresh coat of paint on the front door can make a world of difference in your home’s curb appeal. Over time, paint will fade due to sun exposure, resulting in a lackluster appearance. Your home’s once fiery-red front door may now have more of a dark maroon tone. With a gallon of paint and a brush, however, you can revitalize it with new color. In addition to repainting the front door, you should also decorate the area around the front door. If you have a wooden patio deck, ensure that all boards are secure and not loose or otherwise damaged. Next, place a doormat in front of the door, using a color that corresponds with the surrounding decor. You can also enhance your home’s entryway by adding attractive light fixtures, door knobs and planters. A commonly overlooked element of curb appeal is the mailbox. While it may seem insignificant compared to the front door and entryway, the mailbox still plays an instrumental role in setting the tone for your home’s exterior. The real estate experts as Zillow recommend using a heavy-duty “premium” mailbox along with statement house numbers. A high-quality mailbox should only cost about $150 to $300, while house numbers run about $5 to $10 a piece. For the price, it’s a smart investment that will pay off in the form of a better looking home. While there are dozens of different seating and furniture options from which to choose when designing your home’s exterior, lounge furniture is arguably one of the best. According to the 2017 Houzz Landscape Study, lounge furniture is the most popular outdoor living element among homeowners. As the name suggests, lounge furniture places an emphasis on comfort and relaxation. A chaise lounge, for instance, features a long and adjustable reclining back. Often made of premium teak hardwood, it’s the perfect addition to any patio or outdoor living space. Adding a layer of mulch to your flowerbeds will create a cleaner and more complete curb appeal while also protecting your flowers from frost. In winter, the sub-freezing temperatures can send flowers into a state of shock, causing them to either go dormant or die. With a layer of mulch, however, your flowers will have an extra layer of protection from the winter weather. Mulch acts as insulation, reducing the rate at which your flowers lose heat. Most importantly, though, mulch prevents the growth and intrusion of weeds; thus, creating a cleaner and more attractive landscape for your home. In addition to lounge furniture, another accessory to consider using on your patio or outdoor living space is a fire pit. According to the same Houzz Landscape Study cited above, fire pits are the second most popular outdoor living element; they are even more popular than grills and patio heaters. Installing a fire pit on your patio will create a more “lived in” appearance while also providing functional benefits in the process. With a fire pit, you can cook, roast marshmallows or simply enjoy a quiet evening with friends or family. Of course, you should also manicure any shrubs and trees in your home’s landscape. Neglecting this basic form of lawn maintenance will result in overgrown brush, which doesn’t exactly help your home’s curb appeal. Whether you do it yourself or choose to hire a professional landscaper, you need to manicure all trees and shrubs on your property. A few strategically planed container plants can brighten your home’s curb appeal. Even if you have flowers or plants growing around your home, you should still consider adding container plants next to the front door. Doing so adds color and vibrancy, which can help define your home’s exterior decor. Finally, consider pressure-washing your home’s exterior. Depending on the material of which it’s constructed, it may develop mildew, dirt and grime. A simple solution, however, is to pressure-wash it. The pressurized stream of water will make easy work of even the dirtiest siding. And for stubborn areas, you can pre-treat it with soap or detergent for maximum cleaning power. If you’re planning to update your patio with new furniture, you’ll need to choose the right material. Patio furniture is designed using a wide range of materials. However, one of the most popular is wicker. While most people have seen or at least heard of wicker, few know what the material really is. As shown in the photo to the left, wicker furniture is characterized by a woven design, typically using natural cane materials like rattan, reed, bamboo or willow. Because of this, wicker isn’t a material itself. Instead, it’s a type of furniture featuring a woven design with one or more cane-like materials. It’s a little-known fact that wicker has origins dating back to Ancient Egypt, specifically around 3,000 BC. Archeologists have unearthed wicker furniture made of reed and grasses from the tombs of Egyptian pharaohs. The reed and grasses used in the wicker furniture were native to the surrounding Nile river. In addition to furniture, Egyptians also made wicker baskets, wig boxes, toys and other items. Most wicker furniture is made of natural, organic plant matter, such as reed or rattan. However, some are made of a synthetic material. Also known as “resin wicker,” synthetic wicker furniture is made of PVC, nylon, polyethylene or a combination thereof. These are the same synthetic materials that you’ll find in other furniture, especially outdoor patio furniture. To the unsuspecting eye, both natural and synthetic wicker appear similar. They have the same woven construction with similar-looking material. However, natural wicker furniture is made of organic material, whereas synthetic wicker is made of inorganic, man-made material. This is the fundamental difference distinguishing the two. So, why should you use wicker furniture on your patio? Wicker offers several noteworthy benefits, one of which is aesthetic value. With its woven construction, wicker furniture will enhance your patio decor to create a more attractive living space. This isn’t something you’ll find in other types of furniture either. On the contrary, only wicker furniture boasts this unique woven design, which is one of the reasons why homeowners choose it for their patio. As previously mentioned, wicker furniture is also lightweight. It may take two people to move a heavy hardwood lounge chair, but wicker chairs are easily moved by just a single person. Therefore, you shouldn’t have a problem moving it. If you want to bring your wicker furniture inside, for instance, you can easily do so without straining your back. Furthermore, wicker furniture is relatively inexpensive when compared to other types of furniture. If you’re looking to decorate your patio without spending a fortune, you should consider wicker for this very reason. There are also some disadvantages to using wicker patio furniture, however. Compared to other types of outdoor furniture, wicker is somewhat large and bulky. Assuming you have a large patio, this shouldn’t be a problem. But if you have a small patio with limited space, you may want to choose a different type of furniture. Natural wicker furniture is also susceptible to damage. Granted, synthetic resin furniture can sustain damage too, but it’s stronger and more durable than its counterpart. Over time, it’s not uncommon for natural wicker furniture to become torn and unraveled. And when this happens, there’s usually no easy way to fix it. If you’re interested in using wicker furniture on your patio, you should first plan the design. In other words, determine what pieces of wicker furniture you want to use and where you want to use them. Wicker chairs are always an excellent choice, though you’ll also find wicker sofas and recliners as well. Sitting on a hard wicker surface isn’t exactly comfortable. Thankfully, most manufacturers offer soft cushions with their wicker furniture. Depending on the company, however, you may have to pay extra for it. If you intend to use the wicker furniture for decorative purposes only, you probably don’t need the cushions. But if you plan on sitting and using the furniture — which you probably will — it’s recommended that you invest in cushions. Whether it’s natural or synthetic, all wicker furniture is lightweight. And because of its lightweight properties, it may blow over during storms and bad weather. To prevent this from happening, you should either anchor it to your patio or bring it indoors before it storms. Hopefully, this gives you a better understanding of wicker patio furniture. It’s hard to enjoy an evening out on your patio when you’re constantly being attacked by pests. Whether it’s mosquitoes, gnats, bees, etc., they can prevent you from enjoying this outdoor extension of your home. And while there’s no way to completely avoid all pests, there are ways to discourage them from being on your patio. Garlic (Allium sativum) is a relatively small bulbous plant that’s easy to grow. Aside from its countless culinary purposes — used primarily as a seasoning — it also works as a natural insect repellent. Place some garlic plants in potted containers, arranging them around the area of your patio where you sit. The natural chemicals produced by the garlic plants deters mosquitoes and other insects, all while adding color and life to your patio in the process. If you have a mosquitoes problem on your patio, check to see if there are any standing pools of water around your home. Female mosquitoes lay their eggs in containers that collect water, including buckets, overturned furniture, cups, gardening tools and water pitchers. Even small amounts of standing water can yield hundreds to thousands of new mosquitoes. Therefore, you need to remove all standing pools of water from around your home. Without water-logged breeding grounds, female mosquitoes will look elsewhere to lay their eggs. Tiki torches are a fun and unique decorative accessory for the patio. Featuring a wick atop a source of fuel, they will enhance your patio’s aesthetics while also illuminating the surrounding environment. Rather than using just any tiki torch, however, consider using citronella torches. They look and function just like a regular tiki torch, but they contain citronella oil mixed into the fuel. So, when you light it, it releases insect-repelling citronella oil into the air; thus, helping to keep your patio insect free. Alternatively, you can make your own citronella candles for use on your patio or elsewhere. This involves melting beeswax, pouring it into a mason jar with an affixed wick, and mixing in a few drops of citronella oil. Once the candles have hardened, you can light for them instant insect relief. Sometimes all you need is a little smoke to keep the bugs away from your patio. Insects hate smoke, preferring to keep their distance even if it means missing out on a meal. Building a campfire on your patio is out of the question, though a viable alternative is to use a fire pit, such as those offered here at S&S Fire Pit. If you’re lighting a fire pit for the purpose of deterring bugs and insects, try using wood with a higher moisture content. Normally, it’s best to use dry, seasoned wood, as it burns the easiest and most efficiently. Wet wood, however, is particularly effective at keeping bugs away because it produces more smoke. Just remember to supervise your fire at all times. Of course, another solution to keep mosquitoes, gnats, bees and other pests away from your patio is to use a screened enclosure. As shown in the photo to the right, a screened enclosure creates a barrier between your patio and the outside elements. Without a roof, rain may still drip onto your patio, but insects won’t be able to break through. There are a few downsides to using a screened enclosure, one of which is the cost. Depending on the size of your patio and the type of enclosure, it may cost up to $1,000 (or more). An enclosure may also restrict access to your patio. These are just a few things to consider when deciding whether or not an enclosure is a good idea. Turning on a fan can help keep your patio free of pests. Whether it’s an overhead fan or standalone oscillating fan, the increased airflow will literally blow insects off your patio. Ever notice how insects migrate towards your patio lights? Sure you have! Most insects are attracted to light, which is why you see them buzzing around bulbs at night. Rather than turning off your patio lights, however, you can deter insects by replacing traditional incandescent white bulbs with sodium vapor bulbs. Sodium vapor bulbs use sodium in an activated and “excited” estate to produce light, typically with a wavelength of roughly 589 nm. Technical jargon aside, they produce a more yellowed-colored light as opposed to the white light of an incandescent bulb. And because of their yellow light, sodium vapor bulbs don’t attract insects. As a side benefit, they also consume less energy than their incandescent counterpart. It’s hard to enjoy your patio in the evenings if it’s dimly lit. Without lighting, you won’t be able to cook, relax or simply enjoy this extension of your home once the sun goes down. Thankfully, there are several different patio lighting options from which to choose, some of which we’re going to discuss. String lights offer the best of both worlds in terms of aesthetics and function. As shown in the image to the left, they look like regular Christmas tree lights, featuring long rows of individual light bulbs. You can run them across your patio, the side of your home, or even across the top of your yard. Once activated, they illuminate the surrounding area with a touch of style. Because of their stylish appearance, string lights are a popular lighting choice by homeowners when hosting outdoor parties and gatherings. Uplighting is a relatively new outdoor lighting option that’s becoming more and more popular among homeowners. Uplighting receives its namesake for the direction in which it projects light. While traditional fixtures project light down, uplighting projects it up. Therefore, it’s often used to enhance and highlight specific areas around a home, such as gardens, flower beds, sides and windows. It’s even used by real estate agents to increase curb appeal and make homes more attractive to prospective buyers. Uplighting is best when used in conjunction with other lighting solutions. A traditional overhead fixture, for instance, will illuminate the areas where uplighting can’t reach. Assuming your patio is directly adjacent to your home, you can use wall lanterns to illuminate it. Wall lanterns are installed on the side of a home, creating uniform lighting for the surrounding area. The only real downside is the fact that they are somewhat difficult to install, which usually requires the experience and skills of a professional electrician. Nonetheless, wall lanterns are a viable lighting option for the patio, especially if you want a long-term solution. We can’t talk about patio lighting options without mentioning track lighting. Track lighting involves the use of a fixed track on which individual fixtures and bulbs are installed. The great thing about track lighting, however, is that lights can be moved on the track. If you want to illuminate the center of your patio instead of the outside, for instance, just move the light towards the appropriate area. As explained by Lightology, track lighting has become an increasingly popular lighting solution for patios, gardens and other outdoor living spaces. It offers an unmatched level of flexibility, allowing homeowners to adjust the lights according to their needs. You should check to see what bulb types the track light supports. Some use standard incandescent bulbs, whereas others use energy-efficient CFL or LED. With its natural bamboo design with a flaming top, tiki torches are a fun alternative to traditional patio lighting options. While they’ve been around for centuries — originating from the Tiki culture — they experienced a newfound revival in the 1930s and following years, during which homeowners began using them in outdoor decor. The standard tiki torch design features a bamboo stick with liquid fuel and a wick on top. Once the wick is lit, it continues to burn while drawing fuel from the container below. Tiki toches can be free standing or mounted in the ground. Granted, tiki torches don’t provide the same level of lighting as the solutions previously mentioned, but many homeowners prefer them for their unique ambiance and stylish appearance. The subtle flame burns slow enough to enhance the decor without being overwhelming. Of course, a fire pit can also illuminate your patio when it’s dark outside. As long as you leave the lid off, it will brighten your patio decor without relying on electricity. If you choose tiki torches, a fire pit or any other fire-burning method for illumination, however, you should supervise it all times. Leaving a fire unattended — even if it’s for just a few minutes — poses a serious risk of property damage and injury. While the risk may be low, this isn’t something that you should take a chance on. Always supervise your fire to ensure it’s controlled and contained. These are just a few patio lighting ideas to consider. If you’re still undecided after reading this, take a trip to your local home improvement store to browse other solutions. With a little work, you’ll find the lighting option that’s perfect for your patio. And remember, you can always remove and replace any lighting solution if you aren’t completely satisfied. Seating is an essential element of a well-designed patio. Without proper seating, you won’t be able to relax and unwind on your patio — not without standing, at least. But while there are dozens of different seating options for outdoor living spaces, few offer the same level of versatility as a bench. So, if you’re looking to update your patio with new seating, you should consider a bench for the following reasons. The #1 benefit of bench seating is its natural ability to encourage conversations. After all, a bench is where Forest Gump spent most of his time telling his life story in the hit 1990s blockbuster movie. When two people are sitting together on a bench, they’ll feel a closer connection, both literally and figuratively. So, while traditional seating options like chairs create a distance between two people, benches bring them together; thus, encouraging conversation. A high-quality bench is perhaps the most durable seating option for the patio. As most homeowners already know, chairs made of plastic and other low-quality materials are susceptible to breakage. They may hold up just for fine for several months or even years, only to fall apart the next time you sit down. And when a plastic chair breaks, it’s nearly impossible to fix. Fixing a broken wooden chair may or may not be possible, depending on where the damage occurred. Benches, however, offer a superior level of strength and durability. You don’t have to worry about it falling apart or otherwise breaking. Assuming it’s made of genuine hardwood, it can literally last for generations when properly cared for. A benefit of bench seating that’s often overlooked is its ability to save space. Due to their inherit design, benches are naturally a great seating option for tight spaces. If your patio has a limited amount of space, you’ll need to carefully choose the right furniture. Rather than cramming four bulky chairs into your patio, for instance, maybe you can use a single bench with a side chair. How exactly does a bench save space? Well, it does so by allowing multiple people to sit. Depending on the specific type of bench, it may support two, three or even four people. That means a single bench offers the seating equivalent of up to four chairs. Of course, benches are also easy to clean, typically requiring nothing more than an occasional wipe down with a damp washcloth. For more stubborn dirt — pollen, mud, mildew, etc. — you can add some liquid laundry detergent. In addition to making your bench look 10 years younger, laundry detergent will also leave it smelling nice and fresh. Alternatively, you can often clean minor “surface” dirt by rinsing your bench with a garden hose. As long as the dirt hasn’t settled into the bench’s pores, this should do the trick. Some people assume that pressure washing is the best way to clean a bench, but the high pressure could actually strip away the coating or even take chunks out of the bench’s wooden material. To prevent this from happening with your bench, stick with the garden hose and washcloth methods. Benches aren’t just durable; they are also stable. This is particularly important for homeowners living in areas prone to hurricanes and severe weather. If a storm front rolls through, the strong gusts of wind may blow over patio chairs and tables. Benches, however, can typically withstand severe weather by remaining in place. The exceptional stability of benches is also good for theft prevention. It’s not something that most homeowners want to think about, but there are thieves out there who will steal just about anything, including patio furniture. We can’t talk about the benefits of bench seating without mentioning aesthetics. Granted, benches are available in dozens if not hundreds of different styles. Whether you prefer the classic wooden style, rustic or a newer and more modern style, you can rest assured knowing that it will look great on your patio. Finally, most benches are designed to be weather resistant. Manufacturers add a protective coating on the outside that prevents the intrusion of moisture and germs. Furthermore, some benches are designed with a UV-protectant coating, which as the name suggests, protects against fading caused by the sun’s ultraviolet light. And even if your bench doesn’t have a protective coating such as this, you can easily apply one using a standard paintbrush. These are just a few reasons why benches make the perfect seating for patios and outdoor living spaces. When choosing a patio, however, you should consider the material from which it is made as well as the size. Wood is the most popular choice of material for benches, though cast iron is a popular alternative. Wouldn’t it be great if the weather was warm and sunny every time you went camping? Weather such as this is ideal for camping. You don’t have to worry about your gear being washed away, nor do you have to worry about starting your campfire. Unfortunately, there will be times when mother nature throws you a curve ball by bringing severe rain and storms during your camping trip. Whether you’re a seasoned camper or first-timer, you probably know that campfires are difficult to make in wet conditions. This doesn’t necessarily mean that you should pack up and head home, however. With the right approach, you can successfully build a roaring campfire in rainy weather. Perhaps the most important step in building a campfire in the rain is choosing the right location. If it’s raining, conventional wisdom should tell you that a covered campsite is necessary to your fire going. While it’s possible to build a campfire in a location that’s directly exposed to rain, you’ll have a much easier time if the area is covered. Look for an area that offers some form of natural coverage and protection from the rain. Assuming you’re camping in the middle of woods, you probably won’t be able to find an area with complete, 100% coverage. You can, however, choose an area with a thick, dense tree canopy to shield your campfire from at least some of the rain. Tree canopies offer excellent protection from the rain, catching and distributing the water away from the base of the tree. Therefore, you’ll have an easier time building a campfire under a dense tree canopy if it’s raining. In addition to building your campfire under a covered area, you should also consider using a fire pit. Using a portable fire pit, such as those offered here at S&S Fire Pit, you can further protect your campfire from the rain by keeping it off the ground. Moisture from rain doesn’t come strictly from the skies; it also comes from the ground. When it rains, the ground will absorb and hold moisture, making it difficult to start a campfire. Instead of trying to build a campfire on the wet, water-logged soil, however, you can build it in a dry fire pit. You’ll need to collect the driest firewood possible to get your campfire going in the rain. Not surprisingly, downed limbs under dense canopies are usually the best source for such firewood. After collecting a decent amount of firewood, use a sharp knife to remove the outer layer of bark. Even if the firewood looks dry, it’s probably holding some moisture due to the increased humidity levels accompanied with the rain. Being that the inner core of the wood is typically drier than the outside, however, you can strip away the outer layers so it lights more easily. Using a sharp knife, carefully scrape away the outer layers of your firewood, after which you should place the firewood directly in your fire pit until you’re ready to light it. Want to know the secret to building a roaring-hot campfire in the rain? It’s using kindling, lots of kindling. Basically, wet wood requires hotter temperatures to ignite. And in order to create these hot temperatures, you need plenty of kindling. Tinder — the smaller stuff — is still important, but it’s the kindling that will ultimately create the hot flame needed for a campfire in the rain. When gathering small sticks and twigs to use as kindling, make sure they are relatively dry. Like larger pieces of firewood, you can also strip away the outer layer so they light more easily. Once you’ve gathered the kindling, arrange it at the base of your campfire with the larger pieces of firewood on the outside. The key thing to remember is that the center of your campfire should be somewhat open so that air can flow through. Wet firewood doesn’t burn as “completely” or efficiently as dry, seasoned firewood. This means campfires built in rainy weather or other wet conditions will produce more smoke — and that smoke could pose a risk to your health. 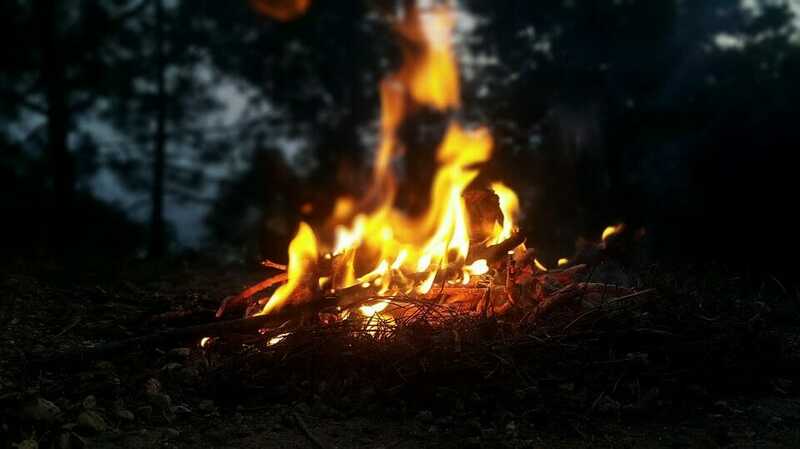 While some people prefer the distinct smell of campfire smoke, you should keep your distance and avoid inhaling it, especially if the wood is wet. Wet firewood produces more smoke when burned than dry firewood, making it more hazardous to your health. The good news is that you can easily avoid your campfire’s smoke by positioning yourself in the opposite direction of the wind. If the wind is blowing south, for instance, position yourself north of your campfire. Building a campfire in the rain isn’t always easy. You’ll need to choose a covered location, find dry or semi-dry firewood, use plenty of kindling and more. However, once you get it going you’ll be able to enjoy the warmth and relaxing ambiance it offers during this otherwise messy weather. Hopefully, this gives you a better idea of how to create a campfire in rainy weather. There are several advantages to grilling food over a coal fire. With charcoal briquettes reaching temperatures of 2,300 degrees Fahrenheit, they tend to produce more heat than conventional wood-burning fires. And with this heat, you’ll have an easier to creating a nice charred outside on your grilled meats and foods. Additionally, charcoal burns more efficiently and produces less smoke than wood. Of course, there are still benefits to grilling over a wood fire, but for these reasons many people prefer charcoal. One of the problems of using charcoal, however, is getting it lit. Dry, seasoned wood easily burns when used in conjunction with kindling and tinder. Coal, however, can take a little bit of work to get going. Rather than wasting an entire box of matches, you should consider using a chimney starter. This otherwise simple tool will make lighting a charcoal fire ten times easier. What is a Chimney Starter? Also known as a charcoal chimney, a chimney starter lives up to its namesake by simplifying the process of starting a charcoal fire. As shown in the photo above, it’s a cylinder-shaped metal device (usually steel) that holds coals. Most chimney starters are about 8 inches in diameter and 12 to 18 inches tall. A few inches from the bottom is a grate with several small holes, allowing air to flow from the bottom and through the charcoal. You’ll also notice that most chimney starters have a single handle attached to the exterior, along with a safety heat guard to protect the user’s hand from injury. The handles are insulated, so you don’t have to worry about burning yourself when using them. However, you should still use extreme caution when moving or even touching a chimney starter that contains hot coals. Chimney starters have one primary purpose: to make lighting charcoals easier. Lighter fluid may sound like an effective alternative, but it isn’t recommended for several reasons. First and foremost, lighter fluid is dangerous and can cause serious injury when used incorrectly (hundreds of people are injured each year from using it). Secondly, lighter fluid produces noxious fumes when burned. Do you really want these fumes reaching the food you are about to grill? A chimney starter is a simple solution to getting a stubborn charcoal fire going. You don’t have to use any lighter fluid. Just fill the chimney with coals, add your newspaper, and it does the rest. And contrary to what some people may believe, chimney starters aren’t expensive. Even if your grill didn’t come with a chimney starter, you can usually buy them for about $10 to $20 bucks at most major home improvement stores, which is a small price to pay for the convenience they offer. To use a chimney starter, you should first remove the cooking grate from inside your grill. Next, fill your chimney starter with your preferred charcoal all the way to the top. You may need to gently shake the chimney to help knock down the coals if they get stuck. Once your chimney starter is full, place a piece of a newspaper inside the bottom of your grill, after which you should place the chimney starter over it. You can then light the newspaper, which should ignite the bottom of the chimney starter and eventually all of the charcoal. As the bottom of your chimney starter heats up, it will easily ignite the coals with the help of increased airflow. Now comes the waiting game. As most backyard chefs know, coals are ready for grilling once they’ve reaches a glowing orange-white color. This characteristic color indicates the coals are hot and ready to be used for cooking. Depending on the size of your chimney starter, the condition of your coals and the surrounding humidity, it should take between 20 and 30 minutes for your coals to reach this state. Next, carefully lift the chimney starter by the handle and dump the hot coals into the bottom of your grill. You may want to wear heat-resistant gloves to further protect your hands from injury when performing this step. Once you’ve dumped the coals into your grill, use a poker or similar tool to spread them evenly across the bottom. Congratulations, your charcoal grill is now ready for cooking! Keep in mind that coals won’t stay hot forever, so don’t wait too long to add your food. This is the traditional method for using a chimney stater. Some people, however, cook foods directly over the chimney itself without ever dumping the coals. It produces intense heat, making it an excellent tool for searing the outside of meats. For many homeowners, fall signals the end of outdoor parties and gatherings. Once the summer comes to an end and the temperatures begin the drop, they head indoors. While there’s nothing wrong spending some extra time indoors during the fall, you can still enjoy your patio and other outdoor living spaces this time of year with the help of a fire pit. This alone should be reason enough to update your patio with a fire pit this fall. When the weather begins to cool, you may find staying outdoors is simply too uncomfortable. With a fire pit, however, you can create a warm and cozy environment on your patio or outdoor living space. Fire pits are capable of producing significant heat, usually around 20,000 to 50,000 British Thermal Units (BTU). That’s more than enough to keep you and anyone else around the pit comfortably warm providing a cool space to socially gather and entertain your guests. According to the 2016 Residential Landscape Architecture Trends Survey by the American Society of Landscape Architects (ASLA), fire pits are one of the top outdoor design trends for homes and residential properties. According to the survey, homeowners prefer fire pits over rain gardens, water-efficient irrigation and a reduced lawn area. The only outdoor design trends that ranked higher than fire pits was a lighting and wireless connectivity. Of course, you can always use your fire pit for cooking as well. Just because summer is over doesn’t necessarily mean that you have to stop your backyard barbecues. A fire pit is the perfect outdoor cooking accessory, as it allows you to easily grill and cook food over an open fire. Whether it’s burgers, hamburgers, pork chops, chicken, shrimp, etc., the possibilities are endless. And because it uses an open, wood-burning flame (not a propane flame), food cooked over fire pits typically have a distinct smokey flavor that many people prefer. Just remember to clean the grill grate on a regular basis to protect it from rusting. Not all fire pits are portable; some are stationary and cannot be easily moved. Assuming you buy your fire pit here at S&S Fire Pit, however, you can easily transport it. This opens the doors to a whole new world of options, allowing you to take your fire pit camping, tailgating or to your other people’s homes. If you plan on moving your fire pit, though, make sure it’s completely cool before touching it. Even if you don’t plan to cook over your fire pit this fall, you still use it to roast marshmallows, S’mores or other goodies. Just skewer up some marshmallows and hold them over the fire for a fun and delightful treat. Roasted marshmallows and s’mores are particularly fun treats for children. So, if you’re planning an outdoor party or get-together with children this fall, make sure you have a fire pit set up. When you think of the benefits of owning and using a fire pit, lighting probably doesn’t come to mind. After all, most people use them for cooking and warmth. While fire pits are excellent for cooking and creating warmth, however, they can also be used to illuminate your patio or outdoor living area. If you’re tired of replacing the overhead light bulb on your patio that keeps blowing, consider using a fire pit as an alternative. Once lit, it will illuminate your patio, even on the darkest of nights. Let’s face it, fire pits offer a uniquely relaxing and enjoyable ambiance that’s not found elsewhere. When you’re enjoying a nice evening on your patio this fall, you can spark up the fire pit to create a more relaxing atmosphere. Studies have shown that fires — whether from a campfire or fire pit — reduce stress and anxiety. Perhaps this is why we’ve been gathering around them for thousands of years. When used on your patio, a fire pit will have a similar effect, creating a relaxing ambiance that you and your guests are sure to appreciate. Finally, including a fire pit on your patio will also create a natural focus point. Rather than randomly arranging your chairs and seating, you can arrange them around the outside of the fire pit, facing towards the fire pit. Not only will this create a more effective design layout for your patio, but it also encourages guests to use and enjoy the fire pit. These are just a few reasons why your patio needs a fire pit this fall. The truth is that you’ll probably find more uses once you actually own one. Fires have been essential for the survival of humankind. For thousands of years, we’ve relied on fires to cook food to a safe temperature, create warmth to protect against hypothermia, and create light. While we continue to use them for these very same reasons today, fire building is also something that many people take for granted. You can buy a box of matches for about a buck at most grocery stores. Instead of the exhausting and tedious task of trying to rub two sticks together, you simple strike the match head against the box, at which point it will ignite into fire. Holding the lit match head under your tinder and kindling should then spark your campfire. And using a safety lighter is equally as easy, requiring nothing more than a flick of the thumb. While matches and lighters are both effective tools for building fires, many people prefer primitive fire-building techniques. Primitive fire building is a survival skill that may one day prove useful. If you’re ever lost or otherwise stranded without access to modern fire-building tools, you can use these methods to create a fire. Furthermore, primitive fire building is always fun show off when camping with friends, even if you have access to matches or a lighter. So, what are some of the most commonly used primitive fire-building techniques? If you watch survival TV shows, you’ve probably seen the hand drill method. It involves the use of a small but sturdy softwood stick with one end carved down to a rounded point, as well as a softwood fireboard. Once you’ve acquired these two items, you’ll need to grind the stick into a notch at the base of the fireboard. By grinding the stick back and forth between your hands, you’ll create friction — and this friction creates heat, which will hopefully create a hot coal that you can then place in your tinder. The hand drill is often preferred over other primitive fire-building methods because of simplicity. Another popular primitive fire-building technique is the bow drill. It’s similar to the hand drill but with a few nuances. Both the hand drill and bow drill method use friction to create heat; however, the latter requires a shorter and wider spindle that’s driven by a bow. By using a bow to drive the stick into the fireboard, this technique allows for easier strokes while minimizing fatigue and exhaustion in the process. Furthermore, the bow drill method of fire-building protects the user’s palms from injury, which is a huge benefit when you don’t have access to medical supplies. Also known as the fire plow, the fire plough is a primitive fire-building technique that involves the use of a softwood stick with a dull point and a long fireboard made of similar material with a groove in the center. When you hear about making fire by “rubbing two sticks together,” this is usually the method being discussed. You press the softwood stick into the groove of the fireboard and rub it together between the palms of your hands in a plowing motion (hence the name). Eventually this will create a hot coal, which you can place in tinder to get your fire going. A lesser-known primitive fire-building technique is the fire saw. To create a fire using this method, you’ll need to saw into a piece of thick wood using another piece of wood. The fire saw method requires two basic components: the saw and hearth. The saw is the piece of wood that you physically move and back and forth to create friction. The hearth is the piece of wood that you saw into. Although simple in design, the fire saw method can be tedious and physically exhausting to perform. There’s a variation of the fire saw method known as the fire thong. It’s performed in a similar manner, but it uses a pullstring consisting of wood fiber or rope. The fire thong method is most commonly used in Southeast Asia by native tribes. Regardless of which primitive fire-building technique you prefer, there are a few things you can do to increase your chance of success. First and foremost, use the driest wood possible. If the wood contains too much moisture, you may struggle to create coals, let alone getting your campfire lit. You can often find dry wood, tinder and kindling under large tree canopies that’s covered and protected from the rain. The primitive fire-building techniques listed above are designed to create hot coals, which you can then use to start your fire. You shouldn’t just drop these coals onto your firewood, however. Rather, place place them on a ball of tinder, at which point you should gently blow to help spread the heat. When performed correctly, the heat from the coal will ignite the tinder into a ball of flame. And once your tinder is lit, you can place it under your firewood to ignite your campfire. Nothing compares to the rich flavor and tender texture of a grilled steak. It’s the preferred choice of meat for countless home chefs. But if you’re planning to grill steaks, you should avoid making the following mistakes. Why do you need to cover your steaks in butter or oil? Well, doing so serves two specific purposes: first, it encourages the seasoning to stick to the steak. Secondly, it prevents your steak from sticking to the grill. So, try to get into the habit of covering your steaks with butter, olive oil, vegetable oil or some other oil before seasoning them. If you’re having trouble lighting your coals, you may feel compelled to douse it with lighter fluid. Unfortunately, this is a serious mistake that will negatively affect the flavor of your steak. The chemical-rich lighter fluid will release fumes when burned that soak into the steak, essentially altering its flavor. Rather than using lighter fluid, a better way to your fire starter is to use a charcoal chimney. After placing newspaper at the bottom, fill it with charcoal and light the bottom. Another common mistake that you’ll want to avoid is placing steaks on a dirty grill grate. If you don’t clean the grate after each use, food particles will harden onto it. In addition to making your steaks stick, this also promotes rust and corrosion. You can clean your grill grates using a basic grill brush and a little bit of water. Many home chefs toss their steaks on the grill immediately after removing them from the refrigerator and seasoning them. A better solution, however, is to let your steaks sit at room temperature for 20 minutes, no more or no less, so the protein enzymes will begin to break down. The general idea is that allowing a steak to sit at room temperature helps it become more tender. So, start a timer once you remove your steaks from the refrigerator, and when it hits the 20-minute mark, toss them on the grill. The general belief is that the hotter the fire, the better the steak, as heat creates a nice seared/charred texture on the outside. The truth of the matter, however, is that too much heat will burn the outside of your steaks. If you’re looking to achieve a Pittsburgh-style steak, this is perfectly fine. For all other occasions, though, you should avoid this by evenly distributing your coals across the bottom of your grill or fire pit. When you’re grilling some delicious filet mignon, you may want to check and see how it’s doing on a regular basis. But each time you open the lid, it disturbs the heat while subsequently affecting the way in which your steaks grill. For traditional charcoal-flamed grills and fire pits, opening the lid allows air to enter, which then increases the heat. To promote an even, thorough cooking, avoid lifting the lid while your steaks are cooking. You should only lift the lid when you need to flip or remove the steaks. Not all steaks are created equal, and it’s important to choose the right type when grilling them. Generally speaking, the most common cuts of steak include filet mignon, sirloin, ribeye, New York strip and Porterhouse. Of all the different cuts, filet mignon is the most tender with the least amount of fat. However, it’s also the most expensive (by weight). In terms of flavor, most chefs will agree that a ribeye is the best, simply because it contains more marbling (fat). Familiarize yourself with the different cuts of steak and choose the one that’s best suited for your personal taste. Try to limit the number of foods you grill at once. If you’re grilling steak alongside shrimp, vegetable skewers and other foods, it may cause cross-contamination. Bacteria from the steaks may seep into the nearby foods, essentially contaminating them. And even if it doesn’t cause cross-contamination, grilling steaks next to other foods will affect the flavor at the very least. Your steaks may have a hint of flavor from the other foods. To prevent problems such as these, either grill your steaks separately or keep them far away from the other foods. Yet another mistake that you’ll want to avoid making is cutting into your steaks immediately after grilling them. Maybe you want to see if they are cooked all the way through, so you cut the center with a knife. Seems harmless, right? Unfortunately, if you cut your steaks immediately after removing them from the grill, the juices won’t have time to settle; thus, they’ll run out of the steak, resulting in a dry texture and lackluster flavor. Let your steaks sit for at least three minutes before cutting into them. These are just a few of the most common mistakes home chefs make when grilling steaks. Humans have been building fire pits ever since the Stone Age. While these were rudimentary — consisting of nothing more than holes dug into ground — they were still critical in allowing our ancestors to cook meat and survive the harsh winter temperatures. Today, we continue to use fire pits for these and other reasons. According to a survey conducted by the American Home Furnishings Alliance (AHFA), fire pits are the second most popular outdoor furnishing, only behind chairs. But if you plan on buying a fire pit, you’ll need to maintain it. By following the tips listed below, you can make your fire pit last for countless years to come. Arguably, the most important thing you can do is choose a high-quality fire pit, such as those offered here at S&S Fire Pit. 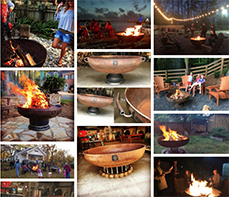 While other companies mass produce their fire pits overseas, we handcraft each and every fire pit here in the United States. On average, it takes at least four hours for us to complete a single fire pit, so you can rest assured knowing you are getting the highest quality available. When using your fire pit, you should avoid burning trash or pressure-treated lumber. Instead, choose natural, locally sourced wood that’s dry and not wet. Burning trash and/or pressure-treated lumber may release toxic fumes and chemicals, some of which may damage your fire pit over time (not to mention it’s bad for your health). And wet wood simply doesn’t burn as easily, so you may struggle to get it lit. Assuming you use dry wood, you should be able to light your fire pit using nothing more than small pieces of tinder and kindling. You shouldn’t, however, use lighter fluid to get it going. Aside from the risk of bodily harm and property damage it poses, lighter fluid may damage the finish on your fire pit. It’s doubtful any noticeable damage will occur after just one or two uses of lighter fluid. Nonetheless, it’s best to err on the side of caution by avoiding lighter fluid altogether. If you struggle to light your fire pit, check out our previous blog post here for some helpful tips. Sure, it’s easier and faster to extinguish your fire pit by dousing it with water, but this increases the risk of damage. Unless it’s an emergency situation and you need to get the fire out ASAP, you should await for the fire to extinguish naturally. Dousing a still-burning fire pit with water causes sudden temperature changes. The 1,000-degree fire is suddenly cooled, which can lead to weaken the fire pit’s structural integrity. If you use your fire pit for cooking — as most owners do — you should clean the grate both before and after cooking on it. A wire grill brush is an excellent accessory that every home chef needs. Using a wire brush, you can scrub your fire pit’s grate to remove any stubborn food or debris. Failure to do so will result in food particles hardening onto the grate. Also, consider applying a cooking oil over the grate before adding your food. A thin layer of vegetable oil will “season” it, while also discouraging rust and corrosion. You can experiment with different types of cooking oils, though many home chefs prefer traditional vegetable oil because of its high smoking point and ease of use. Don’t leave your fire pit exposed to the elements. Ideally, you should either place it under a covered area or use a grill cover to protect it from the rain. Without some type of protection, your fire pit will get soaked — and this can lead to rust and corrosion. Keeping your fire pit dry is essential to preserving its structural integrity and original appearance. This isn’t limited strictly to fire pits, however; this applies to all steel and iron-containing metal accessories. When you are finished using your fire pit, wait at least 24 hours for the fire to extinguish and the ash to cool. Once it has cooled, you can dispose of the ash by scooping it out with a shovel and transferring it to a safe, non-flammable metal container. Never attempt to remove ash that’s still hot. Even if it looks gray and cool-to-the-touch, it could hold enough heat to spark a second fire. When fire pits burn, they’ll produce small amounts of smoke. And within this smoke is soot, which can stick to the surface of your fire pit. Soot isn’t a serious concern, but it’s a good idea to remove it nonetheless. After your fire pit has cooled (about 24 hours), wipe down the surface with a damp paper towel. You don’t have to use any special cleaning products, as a small amount of water should suffice, leaving your fire pit looking nice and clean. Following the tips listed here will allow you to get more use and enjoyment out of your fire pit. The Fourth of July is right around the corner, offering the perfect opportunity for homeowners to host backyard parties and get-togethers. Being that it’s a federal holiday, everyone who works for the government or a government-run service gets the day off work. And even many privately run companies are closed to celebrate Independence Day. So, if you’re planning to host a backyard bash this Fourth of July, here are some tips to make it a success. One of the first steps towards planning the perfect Fourth of July backyard bash is to prepare the area in which you will host the party. Whether it’s your patio, garden or even the driveway, you need to clean and prepare it before inviting friends over. This means mowing the lawn to ensure the grass isn’t overgrown, edging sidewalks and walking paths, and sweeping or blowing any standing debris. You can also use this time to prepare seating for your guests. Think about how many people you intend to invite, and use this number to determine how many seats you need. It’s a good idea to “overshoot” your seating, however. If you plan on inviting 12 people, set up 15 or so chairs. It’s always better to have more chairs than not enough. No Fourth of July party is complete without plenty of delicious food and beverages. Statistics show that Americans consume approximately 155 million hot dogs on Independence Day weekend. Of course, this shouldn’t come a surprise given that Nathan’s Hot Dog Eating Contest is held during this time of year. When most people thing of Independence Day foods, they immediately envision hot dogs. They are delicious, inexpensive, and can be prepared any number of different ways. While hot dogs are always a great choice for the Fourth of July, there are other foods from which to choose as well. To keep your beverages cold, you may want to prepare a cooler (or several). If you’re hosting the party in your backyard, and it’s a long walking distance to your home, a cooler will allow guests to retrieve ice-cold beverages without walking up to your home. Be warned, though, many gas stations and convenience stores sell out of ice early on the Fourth of July weekend, so buy it ahead of time. You’ll also need dishware and cutlery to kick off your Fourth of July backyard bash. Rather than using your own plates, dishes, cups, etc., consider using disposable ones. No one wants to spend hours washing dishes after hosting a party, which is why disposable dishware is preferred. Guests can grab their own plates and cups, and they can dispose of them when they are finished (keep a trash can near the food and eating area). An alternative to plastic is compostable dishware and cutlery. As the name suggests, compostable dishware and cutlery turns to compost after a short period of time, breaking down into nutrient-rich food for plants. Assuming you have a compost bin, you can ask guests to place their compostable dishware and cutlery into your compost bin. This eliminates waste while creating fertilizer for your plants and flowers in the process. The only downside is that compostable dishware and cutlery tends to cost more than traditional plastic dishware and cutlery. Don’t wait until the last minute to send your invitations. With Independence Day fast approaching, you should get them in the mail ASAP. You can create basic invitations using card stock paper, or you can buy pre-made invitations. In your invitations, let guests know where the party is taking place (e.g. your backyard, with a street address), how long it will last, whether food will be served, and what they need to bring (if anything). You can include your phone number on the invitations in case guests have trouble finding your home. In addition to an actual invitation, you should also call and invite guests over the phone. This ensures they get the message regardless of whether the invitation arrives in their mailbox. If you plan on shooting fireworks off this Independence Day, you should follow some basic safety tips to protect against injury and property damage. According to the United States Consumer Product Safety Commission (CPSC), roughly 230 people receive medical treatment at hospital emergency rooms every year on Independence Day for fireworks injuries. Follow all local and state laws regarding the use of fireworks. Never attempt to relight a “dud” firework. Only light one firework at a time. Do not shoot fireworks from bottles or buckets. Beware of sparklers, as they can burn at temperatures of 2,000 degrees Fahrenheit. Keep a bucket of water of garden hose nearby in case of an incidental fire. Following the tips listed here will help make your Fourth of July backyard bash one to remember. A fire pit is the perfect addition to any patio or outdoor living space. It introduces new style, while also allowing you and your family to enjoy the warm ambiance of a fire. Perhaps this is why fire pits consistently rank as one of the top additions to outdoor living spaces. But if you plan on owning a fire pit, you’ll need to know how to properly dispose of the ashes. Allowing ash to sit in your fire pit isn’t recommended, as it encourages rust and corrosion. By following the tips below, you can safely dispose of your ash while preserving the integrity of your fire pit. A good rule of thumb is to wait at least 24 hours after your fire has been extinguished before attempting to touch or otherwise move the ashes. Even if they look cool, ashes may contain enough heat to spark a fire long after the original fire has gone out. This is why it’s best to wait at least one full day before touching the ash. After the ash has thoroughly cooled, you can use a shovel to remove it. It’s best to use a metallic shovel designed specifically for ash removal, just in case the ash is still hot. Ash shovels are inexpensive and readily available at most home goods stores. Simply scoop the ash out of the bottom of the fire pit, at which point you can transfer it to an approved container. And when removing the ash, be sure to transfer it into a dedicated ash bucket. Never attempt to dispose of fire pit ash in a trash can, as this may cause an unwanted fire. Instead, use a designated ash bucket that’s made of metal. If any ash is still hot, you don’t have to worry about it sparking a second fire. If you’re looking for things to do with your fire pit ash, check out this previous post published here. We reveal the top 10 uses for wood ash, some of which may surprise you. Following the tips listed here will allow you to safely dispose of your fire pit ash. Whether you cook over a fire pit or a charcoal/gas grill, you should oil the grate before adding the food. It only takes a few minutes, but doing so offers several key benefits, some of which we’re going to discuss. Grill grates — like all metallic objects containing iron — have a tendency to rust. This isn’t something that happens overnight. Rather, it takes months or years for them to develop any noticeable rust. Once this occurs, however, the corrosion can eat its way through the metal if left unchecked. There are ways to protect your grate from rusting, one of which is covering your fire pit or grill so it’s not exposed to the rain and elements. Rust occurs when iron “oxidizes” with oxygen or moisture. So, covering your grate is an simple and effective way to prevent this from occurring. Furthermore, you can protect your grate from rusting by applying oil to it. Oil acts as a barrier between the metal within the grate and the moisture in the air. In addition to protecting your grate from rusting, applying oil also keeps food from sticking. As any backyard barbecuer knows, food shouldn’t stick to the grate when grilling. If it does, the outer layer — along with all of the delicious seasoning — will be ripped off. The easiest way to prevent this from happening is to oil your grate before adding the food. With a coating of oil over the grate, there’s a significantly lower risk of your food sticking. Before we begin, it’s important to note that you should only oil the grate before starting the fire. Do not attempt to oil it if the coals are burning, as some cooking oils are flammable. Assuming your grill is cool, you can oil your grill in one of several ways: one of the easiest is to apply a spray-based cooking oil. Simply spray the oil over the grate, after which you can add your food. Alternatively, you can brush the oil over the grate using a cooking brush. You don’t need a lot of oil. Place a small amount in a bowl, dip the brush into the bowl, and rub it across the grate until there’s a nice, even coating throughout. What’s the Best Wood to Burn in a Campfire? This is a question many campers ask. While all North American wood can burn, some is better than others. Choosing the right type of wood is important because it allows for a hotter, more efficient campfire that’s less likely to go out. So, which type of wood should you use? Arguably, one of the best wood types to burn in a campfire is oak. Assuming it’s dry, oak produces substantial heat while burning slow and steady. Oak is also readily available throughout much of the country, making it easy for campers to find. According to Wikipedia, North America has the largest number of oak species, followed by Mexico. Hickory firewood is one of the best woods for burning. Hickory is even hotter burning than oak, maple and other popular hardwoods. Hickory is a dense hardwood that can be tough to split, but holds little moisture and burns very well. Hickory is also very popular for cooking. Fraxinus, or what’s more commonly known as ash, is a genus of trees in the Oleaceae family. There are about 50 different species, some of which are evergreen while others are deciduous. Ash wood is known as some of the best firewood in the world. It burns easily, retains minimal moisture, and doesn’t produce a lot of smoke. These characteristics make it ideal for use in a campfire. And unlike other wood types, ash will even burn when green. If you find some ash wood lying around your campsite, try burning it. If you’re building a campfire to stay warm, look for cedar wood to burn. It doesn’t produce as large of a flame as some of the other wood types mentioned, but what it lacks in flame size it makes up in heat. Cedar produces excellent heat, making it the perfect choice for firewood to burn on an otherwise chilly night. Furthermore, cedar has a unique and pleasing aroma that’s not found elsewhere. It’s a subtle yet distinct aroma that most people enjoy. Of course, this is why some furniture polish and other consumer products feature the cedar scent. Chicken is one of the most delicious and versatile meats on the planet. It’s low in fat, loaded in protein, and you can prepare it hundreds of different ways. While baked chicken can be delicious, it pales in comparison to the distinct smokey flavor or grilling it. However, there are a few things you should know to make the perfect grilled chicken. If you want to grill frozen chicken, let it thaw before tossing it on the grill. Cooking frozen chicken will release a substantial amount of moisture, and it also prevents the meat from cooking evenly. This doesn’t necessarily mean that you can’t grill frozen chicken to a safe temperature, but rather it won’t turn out as delicious as grilling thawed chicken. One of the biggest problems home chefs encounter when grilling chicken is having it come out to dry. This isn’t limited strictly to chicken; grilling many types of meats causes dryness. You can keep your chicken moist, however, by marinating it beforehand. To do this, fill a large Ziplock bag with 1-2 tablespoons of olive olive, 2 tablespoons of water, salt, paper, garlic and any other seasonings you prefer. Place your chicken inside and let it sit for at least an hour in the refrigerator, after which you can toss it on the grill. The marinade will soak into the chicken, making it nice and moist when it’s done grilling. Whether you’re grilling over charcoal or a gas grill, wait for it to get hot before adding your chicken. This allows the outside of the chicken to char, essentially “locking” in the juices. If your grill is still warming up, it may make your chicken dry. So, wait for it to get fully hot to ensure moist, delicious chicken. It’s also a good idea to scrub your grill grate before adding your chicken. If there’s any old food or debris on the grate, it may cause the chicken to stick — and that’s never something you want to see happen when grilling. When chicken sticks to the grate, the outer skin will likely tear, along with all of the seasoning. Scrub your grate before adding the chicken and lubricate it with cooking it to prevent this from happening. More and more homeowners are upgrading their patios and outdoor living spaces. While there are dozens of ways to upgrade an outdoor living space, one of the most effective and versatile solutions is a portable fire pit. Using a portable fire pit, you can create a more relaxing atmosphere that’s perfect for parties and gatherings. However, it’s recommended that you turn your fire pit into an outdoor focal point by following the tips listed below. The first step towards turning your fire pit into an outdoor focal point is choosing the right location. Conventional wisdom should tell you that fire pits should not be placed right against the side of a home, shed or any other structure that may ignite. Instead, place it in an open area with at least 10 feet of clearance on all sides. An open area also provides plenty of room for seating, which is another key element to consider when designing your outdoor living space. Once you’ve chosen the right location for your fire pit, you should surround it with comfortable seating. The term “focal point” refers to a specific area where people look by default. When guests enter your outdoor living space, you want them to look at your fire pit — a task that’s easily accomplished through comfortable seating. There are countless seating options available for outdoor living spaces, some of which include Adirondack chairs, chaise lounge chairs, hammocks, swings and lawn chairs. Just remember to arrange them around the fire pit, pointing towards the fire pit instead of away. It’s also a good idea to place your fire pit at eye level. Upon sitting down, guests should immediately fixate their attention on the fire pit. Placing it eye level helps you achieve this goal by naturally drawing attention to the fire pit. Furthermore, placing your fire pit at this height provides optimal warmth, which is particularly important during the late fall and winter months. Some fire pits are tall enough to achieve eye level without any assistance. Others, however, are shorter and require the use of an elevated surface, such as brick pavers. These are just a few tips to turn your fire pit into an outdoor focal point. When it comes to building campfires, the drier the wood the better. Regardless of variety, all wood is highly porous with thousands upon thousands of small holes. These “pores” absorb or release moisture depending on the surrounding atmosphere. If the atmosphere is humid, wood will absorb moisture, making it difficult to burn. So, how do you build a campfire with wet wood such as this? Even if the firewood is wet, you may still be able to light it using — but you’ll need dry tinder first. If it’s been raining, it’s probably best to bring your own tinder, such as newspaper, wood shavings, or even pocket lint. Assuming it’s dry, tinder such as this should easily ignite. If it’s wet, try placing it in direct sunlight for a few hours, allowing the moisture to evaporate. Next, you’ll need to find dry kindling. Kindling is bigger than tinder, though still smaller than conventional firewood. It consists of small twigs and branches of relative size. To determine if kindling is dry enough to use in your campfire, try breaking it in half. If the kindling is dry, you should hear a loud “snap,” indicating that it’s not too moist. If the kindling doesn’t make this “snap” sound, you should find a different source that’s drier and more suitable for use in your campfire. You’ll need dry tinder and kindling to build a campfire using wet wood. Just because firewood is wet doesn’t necessarily mean it won’t burn. However, it’s best to find the driest firewood possible. If you’re searching for firewood in the woods, look under sheltered areas where there’s natural protection from the rain. Underneath a large tree canopy, for instance, is a great place to find semi-dry firewood. The tree canopy acts as a shield, blocking a significant amount of rain from reaching the ground. Any fallen logs here should be drier than logs in exposed areas of the forest. When creating your campfire, arrange the logs in the shape of a teepee, while placing the tinder and kindling underneath. After lighting the tinder, place the kindling over the flame. And once it’s lit, gently blow on the flame to help spread it to the firewood. It may take a little nurturing, but this should get your campfire up and goinf. Kebabs are the perfect food for grilling. Whether they are chicken, steak, veggies, shrimp or a combination thereof, there’s nothing quite like the smokey flavor of grilled kebabs. If you’re thinking about grilling some kebabs, however, you should consider the following tips. One of the problems many people encounter when attempting to grill kebabs is burning their skewers. If you use wooden or bamboo skewers, there’s a good chance they’ll burn, especially when placed in close proximity to the flame. To prevent this from happening, try using metal skewers instead. Not only are they burn-proof, but they are also reusable. Alternatively, you can soak bamboo skewers in water before placing them on the grill. By soaking them in water, they are less likely to burn. They may still “char,” but they shouldn’t burn all the way through. Kebabs have a tendency to stick to the grate when grilled. When this happens, the outside of the food will harden to the grate, forcing you to rip it off. And in doing so, you’ll remove the seasoned exterior of the food, making it less palatable. You can coat the grate in vegetable or olive oil beforehand to prevent kebabs from sticking. Using a brush, apply a small but thorough amount of cooking oil to the grate before lighting the coals. Once the oil has been evenly distributed, you can light the coals and add the kebabs. In addition to preventing your kebabs from sticking, the oil also helps to lock in the flavor. Another common mistake you’ll want to avoid when grilling kebabs is preparing your food in different sizes. If you have a large steak medallion next to several small pieces of onion, conventional wisdom should tell you that the onion will cook faster. And assuming they are on the skewer, you won’t be able to remove the onion when it’s done; thus, resulting in burned onion and/or an underdone steak medallion. To prevent this from happening, cut and prepare your food proportionately. As long as the skewered food is about the same size, it should cook at roughly the same pace. There may still be some nuances regarding cooking times, but it shouldn’t cause any major issues. There are approximately 100,000 wildfires every year in the United States. While lighting strikes are a common cause of these wildfires, another cause is uncontrolled campfires. Campers who fail to take the necessary precautions to control their fire may inadvertently spark one of these hard-to-extinguish wildfires. So, how can you better control your campfire and prevent it from spreading? When choosing a location for your campfire, look to see where nearby trees and brush are located. Ideally, your campfire should be at least 10 feet away from flammable brush and plant life. A stray ember can easily travel to a nearby tree, sparking a major wildfire. Setting up a fire ring around your campfire is a quick and easy way to keep it under control. In the most basic sense, a fire ring is nothing more than a circle of medium-sized rocks placed around the perimeter of the campfire. It’s sole purpose is to control the fire and prevent it from escaping. Depending on where you are camping, there may be existing fire rings left by other campers, which you can typically use to build your won campfire. Even if you use a fire ring, you should still dig a small hole in the center to better control your campfire. It doesn’t have to be deep, as just a few inches is usually enough to keep the fire under control. Both the speed and direction at which the wind is blowing can affect your ability to control your campfire. If you build your campfire downwind, and there’s brush a short distance further downwind, it could spread out of control. This is why most outdoor experts recommend building campfires against a natural windbreak, such as a ridge or large rock. It’s a good idea to keep some water near your campfire. Hopefully, it doesn’t happen, but if your campfire spreads out of control, you can extinguish it by dousing the flames in water. And even if your campfire doesn’t spread, it’s a good idea to douse the flames and ash in water before leaving. Doing so gives you peace of mind knowing that it’s fully extinguished. Why Does My Campfire Keep Going Out? Can’t seem to keep your campfire lit? Whether you’re camping deep in the woods or right in your backyard, keeping your campfire lit is important for several reasons: it provides warmth, cooking fuel, a relaxing atmosphere, and it even repels insects like mosquitoes. The good news is that most campfires will stay lit without any additional work on your behalf. There are times, however, when an otherwise perfect campfire will go out. So, what causes a campfire to go out and how can you prevent it from happening? Going back to the basics of fire-building 101, every campfire needs three things to stay lit: fuel (wood), heat and an oxidizing agent (air). Assuming you have wood in your campfire — and your campfire is burning — neither fuel nor heat are likely the problem. 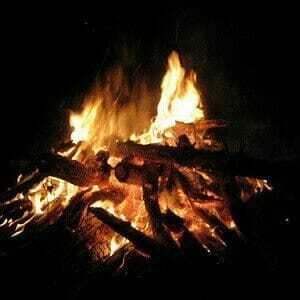 A lack of air, however, can certainly make it difficult to keep a campfire burning through the night. This is why many outdoor survivalists recommend building a teepee-style campfire, which is characterized by an open center through which air flows. Another common reason why campfires go out is because the wood is wet. In order for wood to light — and stay lit — it needs to be dry. If it’s too dry, combustion won’t happen; thus, the campfire will likely go out. If you’re camping in an area where there’s little-to-no dry wood, consider bringing your own. When choosing wood for your campfire, select a combination of small, thin pieces, as well as larger, thicker pieces. If all of the wood is thick, it may struggle to ignite. Not surprisingly, the climate can affect whether or not a campfire stays lit. If it’s raining outside, the water will saturate your campfire and wood, causing the fire to go out. Even if it’s not raining, however, excessive humidity in the air can cause a campfire to go out. Humidity is defined as a measurement of moisture vapor in the air. Although you can’t see it, moisture vapor is all around us. When it’s particularly humid outside, the moisture vapor will saturate wood, making it difficult to keep a campfire burning through the night. A fire pit is a must-have accessory for any patio or outdoor living space. If you’re still on the fence, here are 6 reasons why you need one. This alone should be reason enough to decorate your patio with a fire pit. Some people assume that fire pits are strictly functional, but in reality they offer aesthetic benefits as well. They fill your patio with a new visual element while helping to balance the color and design. Assuming you buy a portable fire pit, such as those offered here at S&S Fire Pit, you can easily move your fire pit. If you’re planning a vacation to a nearby park or the beach, for instance, you can pack up and bring your fire pit. And when you return, you can place it back on your patio. Of course, not all fire pits are portable. Some fire pits are designed to be stationary, which ultimately restricts their utility. As summer comes to a close, many homeowners stop using their patio, preferring the warmth of their home instead. With a fire pit, however, you can keep your outdoor parties going later in the year. A well-made fire pit will provide a source of warmth for you, your family and friends. Whether it’s spring, summer fall or winter, you can enjoy your patio thanks to the fire pit. Mosquitoes can turn an otherwise pleasant evening into a nightmare. The good news is that a fire pit can keep these and other pests at bay. Smoke produced by a fire pit acts as a natural insect repellent, discouraging mosquitoes and other pests. A fire pit even doubles as a grill, allowing homeowners to cook delicious food. Whether it’s burgers, steaks, chicken, pork chops, hot dogs, veggie kebabs, etc., you can cook just about anything on a fire pit. What’s better than the relaxing ambiance of a campfire? A campfire on the beach. However, there are a few things you should know about starting a campfire on the beach. Before sparking your campfire, check to see if campfires are even allowed on the beach. Many beaches throughout the United States prohibit campfires, either for safety or environmental purposes. Others, however, have restrictions, such as using an existing fire ring or building the campfire a certain distance away from the water. Assuming the beach doesn’t require campers to use an existing fire ring, consider building your campfire in a sand pit. One of the hurdles you’ll face when building a campfire on the beach is the wind. Whether you’re on the east coast or west, beaches have little-to-no protection from wind. By digging and using a sand pit, though, you’ll create a natural barrier of protection around your campfire. Even with a sand pit, you may still struggle to get your campfire lit. If wind is a problem, have your group huddle around the campfire to create a wind-break of sorts. By using your bodies as shields, you’ll block the wind from reaching the fire, making it easier to start. Of course, you’ll need plenty of firewood to keep your campfire burning. Again, some beaches have restrictions regarding what you can burn (e.g. no local firewood; must bring your own), so check beforehand. Assuming you are allowed to collect local firewood, look for driftwood that’s washed ashore. Driftwood is typically dry and hard, making it an ideal source of fuel for your campfire. Once you’ve lit some tinder and kindling, allow the heat to rise and ignite your driftwood. It’s a good idea to keep your beach campfire small. There’s no need to create a blazing bonfire on the beach, regardless of how many people with whom you are camping. Keep your campfire small to prevent disturbing the local wildlife and ecosystem. As your fire burns down, add more wood to keep it going. A rule of thumb is to keep your campfire no larger than three feet tall or three feet wide. These are just a few tips to follow when building a campfire on the beach. No camping experience is complete without a campfire. In addition to allowing campers to cook food, it creates a social ambiance that’s more relaxing. However, you should follow a few basic safety tips when building a campfire. Depending on where you are camping, there may be restrictions on building campfires. Some national parks prohibit campfires when it’s particularly dry, while others require campers to build fires in existing fire rings. Always check to see what, if any, restrictions there are on building a campfire. If you plan on staying for a while, you may have some extra firewood — and that’s okay. However, you should store extra firewood upwind to reduce the chance of an incidental fire. If it’s stored downwind, a stray ember may ignite the firewood. There’s really no point in building a large, roaring campfire. On the contrary, doing so only increases the risk of a wildfire. You can cook food and create warmth using just a small campfire. And a small campfire doesn’t pose the same risk of damage and injury as a larger one. Burning your trash may seem more convenient than bagging and carrying it with you, but this practice is frowned upon for several reasons: for starters, burning trash, especially plastic, releases toxic fumes into the air. Secondly, some trash won’t burn down 100%, meaning remnants will be left behind. The bottom line is that you should only burn firewood in your campfire, not trash or debris. Even if your campfire “looks” like it’s out, it’s a good idea to douse it with water before leaving your campsite. The ashes can store enough heat to spark a second fire for up to 24 hours. By pouring water over them, however, you’ll prevent this from happening, protecting the surrounding plant life and vegetation from a wildfire. I know this probably sounds like common sense, but it’s still worth mentioning that you should never leave a campfire burning unsupervised. According to National Geographic, more than 100,000 wildfires occur in the United States each year, burning some 4 to 5 million acres of land. Many of these wildfires are the result of unsupervised campfires. As any camper already knows, food just tastes better when it’s cooked in the wilderness. But cooking over a campfire poses some unique challenges, which can make it difficult to enjoy a meal. 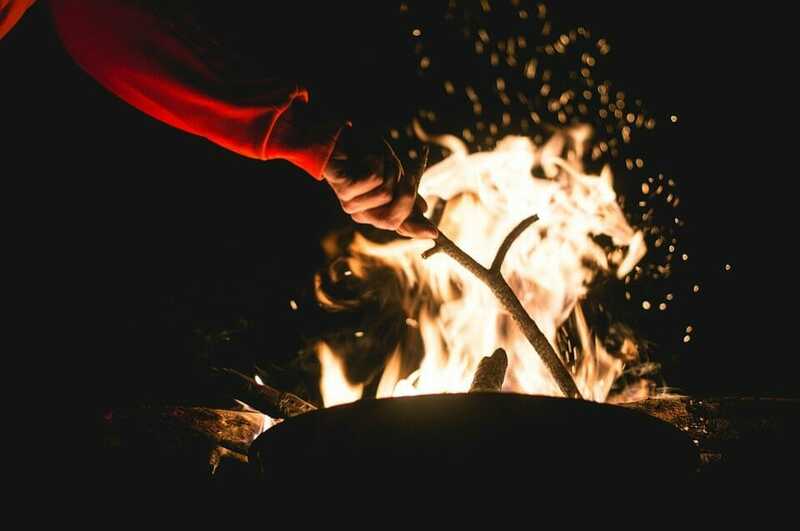 If you’re looking to improve your backwoods culinary skills, check out the following campfire cooking hacks. Rather than just tossing your meats in the cooler, try marinating them in sealed plastic bags with your preferred marinade sauce. Whether it’s steaks, chicken, pork chops, etc., marinating infuses the meat with additional juice and flavor, making it that much more enjoyable to eat. What’s wrong with cooking fatty foods over a campfire? Well, the problem with fatty foods like pork loin is that they drip fat — and this fat can cause your campfire to flare up. If you’re going to cook fatty foods, use a skillet or pan to control the fat. You should always bring a roll of aluminum foil when cooking over a campfire. Using foil, you can create pockets of your favorite foods and dishes. For instance, you can toss all of your vegetables into a single foil packet, after which you can place the packet over the campfire. This is a quick and easy way to cook multiple foods over a campfire. Best of all, everyone with whom you are camping can create and cook their own foil packet of food. Because campfires typically produce more heat than a traditional grill, you’ll need to turn your food often. Forgetting to turn your food will likely result in it getting burned. A little charred skin isn’t much of a concern, but it can quickly turn to ash if you aren’t careful. The bottom line is that you need to turn food often when cooking over a campfire, especially if the fire is roaring hot. Be sure to bring olive oil, vegetable oil, coconut oil or some other type of cooking oil. In addition to pan-frying, you can use oil to coat the grate, preventing food from sticking to it. Simply brush a small amount of oil over the grate before cooking to create a non-stick surface. This prevents your food from sticking to the grate while also allowing for more even distribution of heat. Mother nature isn’t always going to provide sunny clear skies with little-to-no wind. While strong winds typically don’t pose a concern, it can make it difficult to keep your fire pit burning. 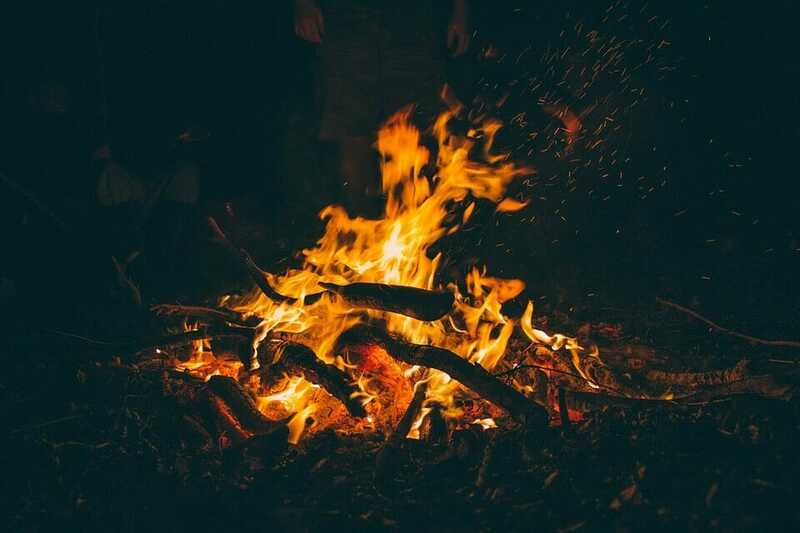 Before packing up and calling it a day, however, you should consider the following tips on how to use a fire pit in the wind. The right location can help protect your fire pit from the wind, allowing it to burn in otherwise not-so-ideal conditions. Assuming you have a portable fire pit, try moving it next to a windbreak, such as the side of your house or next to a wooded area. Natural and man-made structures such as these will block the wind, making it easier to keep your fire pit burning on a windy day. Just remember to keep your fire pit far enough away so that a stray ember doesn’t cause property damage. If you don’t have access to a wind break, try standing around your fire pit to block the wind. If you have a couple buddies with you, you can create your own wind break of human bodies. This isn’t as effective as using a house for a wind break, but it can still help by slowing down the wind. If you have a tarp and some bungee cords on hand, you can try making your own wind break. First, identify the direction from which the wind is blowing. Next, stretch out the tarp and attach it to some nearby trees or structures using the bungee cords. Double-check the bungee cords to make sure they are secure, after which it should block the wind from reaching your fire pit. Of course, another idea is to cover your fire pit with a lid. With a lid over your fire pit, wind won’t be able to reach the fire. If you don’t have a lid for your fire pit, try using a grill lid. If it’s the same size — or about the same size — it should work just as well, blocking the wind from reaching the fire. These are just a few tips to keep your fire pit burning on a windy day. With summer right around the corner, there’s no better time than the present to invest in a fire pit. A high-quality steel fire pit will allow you to enjoy the outdoors by hosting backyard parties with friends and family. However, you’ll need to familiarize yourself with the following maintenance tips to preserve the look and integrity of your new fire pit. Try to get into the habit of cleaning the ash out of your fire pit after using it. Allowing ash to settle and sit at the bottom promotes rust. The ash soaks up moisture vapor in the surrounding air, and this moisture reacts to the metal of the fire pit to create rust. You can prevent this from happening, however, by cleaning the ash out of your fire pit after using it. Just remember to wait until the ash has cooled, after which you can safely shovel it into a metal container. In addition to shoveling out the ash, you should also clean your fire pit’s grate on a regular basis. Assuming you cook with your fire pit — as most people do — particles of food will become stuck to the grate. Using a wire grill brush, gently scrub the grate to remove these particles. If there’s any stubborn food that doesn’t seem to come off, add a small amount of soapy water to the brush. You can further prevent food from sticking to your fire pit grate by wiping the grate with vegetable or cooking oil before cooking. It’s a good idea to wipe down the outside of your fire pit to clean any pollen and dust. While the presence of pollen isn’t going to affect the function of your fire pit, it can certainly affect its aesthetics. Thankfully, a quick wipe-down should eliminate particles such as this. Depending on where your fire pit is stored, you may need to cover it to protect against bad weather. Leaving your fire pit exposed to the rain or snow is never a good idea. Again, too much moisture can cause rust and corrosion, not to mention the fact that it turns any standing ash into a sludge-like mess. So, either move it under a covered area or purchase a separate “cover” to user over your fire pit. Looking to build a better fire? Here are some tips to help. Don’t underestimate the importance of using dry, seasoned firewood in your fire. The presence of moisture inhibits the combustion process, resulting in less fire and more smoke. While all firewood will have at least some moisture, you should avoid wood that’s noticeably damp or wet. Instead, choose firewood that’s been properly stored and seasoned over time. Whether you’re building a campfire on the ground or in a fire pit, you should choose a location that’s protected from the wind. Even minor gusts of wind can make it difficult to start a fire — or keep a fire going. If you’re using a fire pit, for instance, perhaps you can set it up next to your house (just keep far enough away to prevent property damage). If you’re building a campfire in the wilderness, try creating your fire next to a ridge. The bottom line is that you need some type of wind break to protect the fire from wind. A good campfire begins with tinder. It gets the fire burning hot more quickly, at which point you can add larger pieces of firewood. Some excellent tinger includes dry leaves, bark, wood shaving, grass and pine needles. Alternatively, you can bring your own tinder from home, such as dryer lint. The key thing to remember is that tinder should be small and exceptionally dry; otherwise, it’s not going to catch well (or at all). Alongside your tinder, you should also include some twigs and small sticks (kindling). The combination of tinder and kindling is guaranteed to get your fire burning hot. Fire needs three key components to burn: heat, fuel (e.g. wood) and oxygen. As such, you need to create your fire in a manner that encourages airflow. You should still protect your fire from wind gusts via a wind break, but you should also design it with an open configuration so that air can flow through the fire. A teepee-style campfire is a popular choice for this very reason. Propping up the firewood in the shape of a teepee allows air to flow through the center, helping to fuel the fire and keep it burning hot. No outdoor living space is complete without a fire pit. It opens the doors to a whole new world of possibilities, allowing homeowners to host parties, backyard barbecues, or simply enjoy a relaxing evening by the fire. But it’s important to create the right area for your fire pit, which is something we’re going to discuss in this blog post. When choosing a location for your fire pit, a good rule of thumb is to keep it at least 10 feet away from your house and any other flammable structures, both natural and man-made. Even if the fire doesn’t reach these structures, a stray ember could float over to it, causing a fire. You should also consider accessibility when choosing a location for your fire pit. If it’s a quarter-mile away from your home, you probably wont use much. Keep your fire pit relatively close — but not too close — to your home so you and guests can easily travel back and forth. Whether you place your fire pit directly on the ground, a concrete/paved area, or a wooden deck, you should clean it. Remove all leaves and debris before adding your fire pit. Once clean, you can then move your fire pit into place, preparing it for use. Assuming you choose to place your fire pit on a wooden deck, you’ll need to place something underneath it to protect the wood. Some strategically placed brick pavers should do the job, or you can buy a special fireproof mat that’s designed to resistant heat. Either way, it’s important to place something underneath your fire pit to protect your wooden deck from the heat; our rule is to be smart. Of course, you should also add seating around your fire pit. When you get ready to use your fire pit, you’ll probably want to sit down, relax and enjoy the relaxing atmosphere it creates. There are dozens of different seating options from which to choose, including chaise lounge chairs, foldout “camping” style chairs, benches, Adirondack chairs, teak chairs, plastic chairs, swings, or even hammocks. The great thing about seating is that you can easily add and remove new seats as you please. If you aren’t happy with your current fire pit seating, replace it with something else. The warm weather and colorful plant life can only mean one thing: summer is almost here. June 21 marks the first official day of summer, offering homeowners the perfect opportunity to upgrade their outdoor living space with a new fire pit. So, why should you invest in a fire pit this summer? Let’s face it, eating out night after night isn’t exactly good for your health — and “sit down” restaurants are no better, either. In fact, one study found that eating out at sit-down restaurants was just was bad as picking up fast food. If you have a fire pit, however, you’ll probably spend more time making and preparing your own meals, which is certainly a healthier option for you and your family. In addition to making your own meals, a fire pit will also encourage you to spend more time outdoors. The summer isn’t here for long, so why not go outdoors and enjoy out? We suggest a “summer time fire”, which is not going to be as big but still provide ambiance, but less heat. Unfortunately, far too many people stay cooped up indoors all-year long. But if there’s something that draws you outside, such as a fire pit, you’ll find yourself spending more time under the sun. Assuming you buy your fire pit from us here at S&S Fire Pit, you can take it with you wherever you go. Whether you’re going tailgating, camping, or headed to a friend’s house, bring your fire pit. One of the great things about having a portable fire pit is the near-limitless options it provides. Of course, you can always use it in your own backyard, but you can also take it to other places. While you can use a fire pit solo, it’s typically a social activity in which multiple people participate. This makes it ideal for hosting backyard parties and barbecues. When everything is gathered around your patio or outdoor living space, you can spark up for the fire pit to set the mood. I guess the better question is why shouldn’t you get a fire pit for the summer? These are just a few of the countless reasons why a fire pit is a smart investment for the summer. Grilling your own food offers several benefits, some of which we’re going to discuss in today’s blog post. While there are always exceptions to this, grilling is typically a social activity in which multiple people participate. Even if it’s just sitting around the grill or fire pit, it offers the perfect opportunity to converse with friends and family. Whether it’s a burger, steak, hot dogs, pork chops, etc., there’s just something about grilled food that makes it taste better. According to an article published by Business Insider, grilled food scientifically tastes better because of a specific compound found in charcoal. Known as guaiacol, this compound is responsible for the distinct smokey flavor of grilled food. Since grilling is done outdoors, it allows you to soak up the sun. If you work a traditional 9 to 5 job in the office, you may not get many opportunities to enjoy the outdoors. Grilling food for lunch and/or dinner, however, is a window during which you can go outside and get some sunshine. As a side benefit, the increased sun exposure from grilling outdoors will trigger vitamin D production in your body, helping to prevent vitamin D deficiency — an-all-too common condition from which millions of men and women suffer. Let’s face it, one of the downsides to cooking food in the kitchen is the simple fact that it gets messy. You’ll have pans and utensils strewn all over the place — something that discourages many people from cooking in the first place. Grilling, on the other hand, keeps your kitchen a little cleaner. These are just a few reasons why you should grill your own food. And with summer right around the corner, the weather is perfect for outdoor grilling. It’s frustrating when you finally get that damp wood lit, only for your campfire to go out in the middle of the night. While you can always stay up to stoke it and add more wood, most people prefer sleeping at night, especially after a long day of hiking. So, how can you keep your campfire burning through the night? What is the 1/2-inch rule? Basically, for every 1/2 inch of firewood, your campfire will burn for about an hour. If you have a 6-inch piece of firewood, you can expect it to burn for six hours. Or if you have an even larger 8-inch piece of firewood, it will burn for about eight hours. Of course, this is just a general rule, as some wood burns faster and others burn slower. With that said, you can still follow this rule to choose the right-sized firewood to keep your campfire burning through the night and well into the morning. For the purpose of heat retention, it’s recommended that you build a tipi-style campfire. As the name suggests, this type of campfire is characterized by its shape resembling that of a Native American tipi. Firewood is arranged in a standing cone-like design around a bundle of kindling and tinder. Once the inside kindling and tinder is lit, the heat rises to the exterior firewood. The tipi-style campfire is one of the easiest to build, and it’s also one of the most efficient. Another trick that can keep your campfire burning longer is to place ash over the top of it. Ash makes the wood burn more slowly, which should keep the campfire going for a little longer. The only downside to this method is that you’ll need ash — and that requires a campfire. Some outdoor enthusiasts recommend placing rocks inside the campfire. The general idea is to allow the rocks to absorb the heat, at which point it should keep your fire going a little longer. Rocks hold heat incredibly well, which is why people have used hot rocks them for therapeutic purposes for centuries. These are just a few tips to keep your campfire burning through the night. Thinking about taking your fire pit camping? We have some tips to help you get the most use from it. Assuming you plan to use your fire pit for cooking (which most campers do), it’s recommended that you bring a grill grate. Granted, you can cook over an open fire without a grate, but using one makes the process ten times easier. A basic metal grate turns your fire pit into a grill, allowing you to cook delicious foods more quickly and evenly. Fire pits are available in a wide range of sizes. For camping, though, it’s best to stick with a smaller and more portable fire pit. Large fire pits are typically too bulky and heavy to carry long distances, making them a poor choice for camping. This is particularly true when speaking about stone fire pits, which should not be used for camping. As most seasoned campers already know, a tabletop surface is a rare commodity in the wilderness. Unless you bring a foldout table, you’ll probably have to eat from your lap. However, you can bring a smaller and more portable fire pit tabletop for increased convenience. Once the fire is out and it has cooled off, you can place the tabletop over the fire pit. Not only is the perfect surface for eating, but you can also use it to play cards, read a book, write, etc. Unless you plan on rubbing two sticks together, make sure you pack matches or a lighter. There’s nothing more frustrating than making your way to your campsite, only to discover that you forgot the matches. Double-check your gear before leaving, ensuring you have some tool to easily light your fire pit. Last but not least, you should wait for your fire pit to cool off before attempting to load it into your car or vehicle. A fire pit can remain hot long after the fire goes out, so don’t assume it’s cool just because there’s no wood burning. Wait until the fire pit is cool to the touch before transporting it to avoid injury. Conventional wisdom should tell you that water and fire pits don’t mix. When a fire pit fills with water, it mixes with any leftover ash to create a sludge-like mess. Not only is this unattractive, but it can also make it difficult to start a fire. So, what steps can you take to keep your fire pit from filling with water? If your fire pit is stationary (e.g. built into the ground), you may have trouble keeping rainwater out of it. On the other hand, if your fire pit is a S&S Fire Pit, you’ll have an easier time keeping it dry by simply placing on of our snuffers lids on the pit and as well we have a built in drain hole. You can protect your fire pit from rain by covering it with a tarp. You can use a special tarp designed for fire pits, or you can use one designed for grills. Either way, a heavy-duty tarp made of a strong synthetic material should protect your fire pit from the elements. When using a tarp, however, you should wait until your fire pit has completely cooled off. Throwing a tarp over a recently lit fire pit may result in damage. The heat from the fire pit will literally melt the tarp, creating a large hole through water can flow. And when your tarp is melted, it’s not going to offer much protection from the rain or elements. Of course, you can store it under a covered area. Whether it’s in the garage, basement, storage shed, etc., storing your fire pit under a covered area is a sure-fire way to protect it from water. Again, it’s important to note that you should only store a fire pit under a covered area once it has fully cooled off. A fire pit can remain hot enough to reignite for up to 24 hours. To prevent property damage and injury, wait until your fire pit has cooled off before attempting to move it. What animal is responsible for more deaths than any other animal on this planet? It’s the mosquito. Although small in size, these blood-sucking pests carry a wide variety of infectious diseases, which is why it’s a good idea to keep them away from your campsite. The good news is that you can build an effective deterrent by using a campfire, and here’s how. First and foremost, it’s important to note that smoke is a natural insect repellent. Most insects, including mosquitoes, prefer to avoid smoke, so building a campfire tends to work pretty well for this purpose. You don’t have to necessarily stand in the same direction in which the smoke is blowing, but rather stay around the campfire to keep mosquitoes and other bugs at bay. If you really want to improve the pest-repellent power of your campfire, try burning some citronella leaves. You’ve probably seen (or used) citronella candles before. They are a popular type of outdoor candle due to their bug repellent properties. The tropical plant has natural oils that, when burned, turn into a pest repellent. And best of all, it’s completely safe so you don’t have to worry about toxic or otherwise harmful chemicals. Although, we don’t like it, if you don’t have any citronella on hand, you can always increase the amount of smoke produced by your campfire to enhance its pest repellent properties. Adding more leaves and pine straw to your campfire, for instance, will make it produce more smoke, which in turn increases its ability to keep bugs at bay. When possible, try to choose a dry campsite with little-to-no standing pools of water. Mosquitoes thrive in moist environments, and just a small pool of standing water can result in their numbers multiplying at an increasingly fast rate. Look around to ensure the land and surrounding area is dry before pitching your camp. Even if you follow these tips, you may still struggle to keep all mosquitoes away from your campsite. Bugs are just a part of camping, and it’s nearly impossible to avoid them altogether. However, these tips can certainly help to minimize the number of mosquitoes and other pests that you and your fellow campers encounter. So, you’re thinking about buying a fire pit? With the warm weather fast approaching, there’s no better time than the present to invest in a fire pit for your patio or outdoor living space. However, you’ll want to choose the right type of fire pit. If you plan on moving your fire pit, which most people do at some point or another, you’ll want to choose a portable fire pit. Some fire pits are designed to be stationary, while others are 100% portable. Opting for a portable fire pit opens the doors to a whole new world of possibilities, allowing you to take it camping, tailgating, to parties, or pretty much wherever else you desire. Of course, you should choose a fire pit of high-quality material, such as steel. Some of the cheaper fire pits on the market are made with low-quality materials that quickly break down and deteriorate. There’s nothing more frustrating than buying a fire pit, only to discover that it’s broken just a few weeks later. To avoid such problems, choose a fire pit of high-quality steel. Arguably, one of the most critical factors to consider when choosing a fire pit is the size. Fire pits are available in a variety of sizes, ranging from small to large. The 42″ Ellipcital, for instance, has a 42″ opening, making it large enough to build fires and cook meals over. If you plan on using it for tailgating, however, perhaps a smaller fire pit would work better. Consider when and how you’ll be using it, and choose an appropriately sized fire pit. A fire pit is more than just a safe container in which to build fires; it’s a decorative accessory. As such, you should choose a fire pit that flows cohesively with your outdoor decor. Where is the fire pit made? You can probably save a couple bucks by purchasing a fire pit from overseas, this is one instance in which the saying “you get what you pay for” holds true. These overseas fire pits are often made with cheap materials that don’t fare so well when compared to locally made fire pit. By purchasing a fire pit here at S&S Fire Pit, you can rest assured knowing that it’s made in the United States. Can You Build a Fire with Wet Wood? When it comes to building campfires, the drier the wood, the better. If wood contains too much water, you may struggle to ignite it. And even if you do ignite it, it may produce an excessive amount of smoke with minimal fire. Whether it’s a softwood or hardwood, wood is like a sponge. It constantly absorbs moisture from its surrounding environment. When it rains, wood absorbs the moisture vapor from the air, making the firewood difficult to burn. So, how do you build a fire with wet wood such as this? It’s recommended that you stay away from lighter fluid, gasoline or other flammable liquids when attempting to light wet firewood. While it may ease the process of lighting the wood, it also increases the risk of injury. The flammable liquid can spill in your backpack and seep through your clothes, or it may get accidentally knocked over into the fire. Either way, there’s simply too many things that can go wrong with using flammable liquids in a fire. To begin, gather small pieces of wood from covered areas such as under tree canopies and against ridges. Smaller pieces are easier to light, and once you get that initial flame, you can add larger pieces. Because moisture typically only penetrates the outer layer of wood, you can strip it away to better prepare it for burning. Using a knife or hatchet, carefully strip away the outer layer from your wood, discarding it to the side. Next, place this newly stripped wood around some tinder and kindling and light the center. Without the wet exterior, it should ignite with relative ease, allowing you to enjoy the warmth of a campfire. How Long Does it Take Wood to Dry? Of course, you might be wondering how long it takes wet firewood to dry out and become more suitable for burning. Well, it depends on several factors, including the species of wood, size, surrounding humidity, and level of exposure to sunlight. With that said, it usually takes several months for wet firewood to completely dry out to the point where it’s “seasoned” and ideal for burning. There are numerous myths floating around about fire pits and how they work. Today, we’re going to debunk some of these common myths, shedding light on this popular outdoor living accessory. While it’s true that some fire pits are permanent, others are not. If you want to move your fire pit, it’s recommended that you choose a portable style. Portable fire pits open the doors to a whole new world of possibilities, allowing individuals to take it camping, tailgating, or simply move it to a new area on their patio or back deck. There’s no denying the fact that a fire pit is a brilliant decorative accessory for outdoor living spaces, but they also offer functional benefits as well. Using your fire pit, you can grill burgers, roast marshmallows, or simply create warmth on an otherwise chilly evening. Again, some fire pits may certainly sell for thousands of dollars, but others are more budget-friendly. As you can see from shopping on our website, we offer high-quality portable fire pits (built here in the U.S.) at affordable prices. The 30-inch “Short Boy,” for instance, is currently available for just $325. This statement couldn’t be further from the truth. Maintaining a fire pit requires very little effort. After burning it, wait for the ash to cool, at which point you can dispose of it. You can then clean any lingering dust or dirt from the surface using a towel. You don’t have to worry about cleaning your fire pit with any special product or chemical. Owning a gas-fueled fire pit can take a toll on your wallet, but it’s important to note that not all fire pits use gas. Many burn wood as a source of fuel, and these are generally recommended for homeowners seeking an authentic fire pit experience. Wood is cheaper, safer and easier to use in a fire pit, making this type ideal for the average homeowner. These are just a few of the most common myths surrounding fire pits and how they work. No camping experience is complete without a campfire. Ever since the early days of mankind, humans have created campfires to cook food, illuminate their surroundings, stay warm in cold weather, and for the relaxing social ambiance it creates. But if you plan on creating a campfire in the wild, you’ll need a few basic items to get started. Unless you plan on rubbing two sticks together, or using an alternative primitive firestarting method, you’ll want to bring either a lighter or matches when camping. Some people prefer lighters, while others prefer matches. Regardless, you’ll need one of these to start your campfire. Of course, also need firewood (and lots of it) to build a campfire in the wild. More specifically, you’ll need three types of wood: tinder, kindling and large pieces of firewood. Tinder is the smallest type of natural fuel used in campfires. It can consist of bark, fatwood, pine needles and even grass. Kindling is larger than tinder though smaller than standard-sized firewood. Examples of kindling include sticks and small branches about the size of your index finger. Not every wooded location is suited for a campfire. When camping, check the park’s rules to determine where you can build campfires. Some parks have strict rules requiring campers to build campfires in specified areas. And in the dry season, all campfires may be prohibited to reduce the risk of a wild fire. Grill grate. Assuming you want to cook over your campfire, you may also want to bring a grill grate. While you can always pierce food with a stick or skewer, a grill grate is easier and more versatile. Pitcher. What do you need a pitcher for? Well, before leaving your campsite, it’s recommended that you pour water over the campfire ashes to ensure they are fully extinguished. Ashes can remain hot enough to ignite grass and other dry material for up to 24 hours, which is why it’s a good idea to pour water over your campfire before leaving. Shovel. Using s shall shovel, you can create a more well-defined fire ring to help contain your campfire. You can also use a shovel to bury your ashes before leaving the campsite.